Product test conducted on 1,000 people. 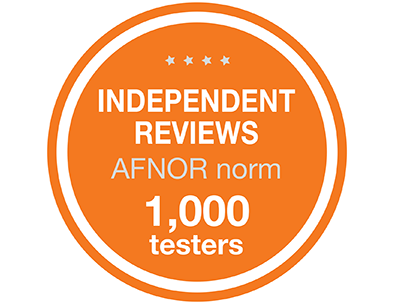 Consumer reviews were collected and published by the independent website “TesterTout.com” and conform to the norm AFNOR NF Z74-501 which guarantees independance and exactitude of reviews. 5/5 for iphone 4S Migraines and headaches have significantly decreased. After several weeks, I haven't seen any significant improvements. I keep it installed anyway as it is discreet and it is not disturbing. Samsung S3. Hello, I didn’t see a big difference after FAZUP patch installation. Apparently. It is efficient, yes, as I feel that I have less headaches. I use a cell phone very often, even as an alarm clock. So, it is always with me!!! Bravo for this invention!! Pleasantly surprised by the result! Hello. I have an iPhone 4s and since I installed fazup on my cell phone I felt that I have been having less migraines (it is still switched on and loading next to my bed) I recommend fazup even though it’s a bit expensive to buy. Besides, I want to buy another patch to install it on the other cell phone. Hello, here is my impression about your product. I think that it really reduces mobile phone radiation around me, I have less migraines and I am happy about that. I strongly recommend it to people who are quite sensible like me! Hello, I’ve got Samsung galaxy ace and I haven't noticed any changes since I started using fazup. Maybe just a little bit less of tinnitus. Hello, Thank you for the test of fazup on my IPHONE 5S. I have much less headaches at the end of the day although I pass a lot of time with my phone at work. Above all, my phone is heating less. Thank you! Iphone 4S. I haven’t seen any real changes after I installed the patch. The network in Paris is already good, even very good. Easy to install. My galaxy S is heating less. I have less tinnitus and less headaches in the morning (my phone is my alarm-clock). Given the price, I wouldn't have bought Fazup myself as I had been quite skeptical about it. Thank you for making me test it: I am satisfied with the result and convinced of its effectiveness. I will recommend this product. Easy to install. Subject to migraines and having my phone with me day and night, I tested Fazup. Despite my doubts, the results were positive. Much less migraines. No more heating of the phone. Thank you for this test. A product to try out. Used on IPhone 4. Reduces the headaches and the phone is really heating less despite of its age. Easy to install and it is no bother at all. It’s a very good product especially when we have a baby with us! Thank you! After one month of usage, I am highly satisfied, much less headaches due to the phone and once installed, we forget about its presence. What could be better! Great! A very good product, easy to install and discreet. After 1 month’s usage, my phone is still heating after long conversations and gaming, but less than before. The frequencies have slightly decreased my headaches, but I have to mention that I try to reduce the time spent on the phone not to exceed my mobile subscription very much. Thanks for choosing me for this test. After 1 month’s usage on my s3, I am satisfied with the product. Approximately 6h/ the phone is heating less (but is still heating after a while) concerning the headaches, I even felt a small decrease. I’ve installed the fazup patch on my iphone and I must say that I’m really satisfied. The packaging is nice and it's easy to install. For me its effectiveness is proven, as I’ve got much less migraines. I am using my phone very often due to my profession and I feel more secure facing this dirty mobile radiation! In addition, the phone is heating much less and I have very few headaches! After having tested it on my samsung, I am very satisfied with this patch essentially because after I have installed it, I have no more tinnitus! Immediately and obviously! After the test, 5/5 for Fazup as I am very sensible to the mobile radiation and I haven’t found a solution until now. So, thanks to the team of Testertout. After the test and continuous usage, I could have noticed that my cell phone is heating much less than before. Moreover, being a subject to headaches, I could have noticed that they’ve been less severe than before and some days even nonexistent. I am delighted with this test, because spending a tremendous amount of time on the phone, I’ve felt the change. In fact, I’ve got Samsung and my phone seems to be less hot but more importantly I’ve got less headaches. I have iphone 5 and I am very satisfied, less headaches and no more tingling, not to mention the phone that is heating less! And all this in less than one week of testing. Thank you TESTERTOUT!!!!!!!!!!!!! I’ve been testing FAZUP approximately for 1 week now and I’ve indeed noticed positive effects when I’m on the phone. Less headaches! To be continued! Migraines, headaches, tingling and on the top of that originally epileptic, here is my profile... Therefore, I was a good target for this test! I’ve got iPhone 4s and I am very satisfied with FAZUP. I gave it 5/5, as the effect was present quite fast. Very happy with fazup, as I have no more migraines and I am epileptic. I’ve spoke about it with my doctor who had advised me to keep it, as it could have been only a positive thing for my phone. Especially as I am highly addicted to my phone! In fact, I’ve been testing it since 2 weeks ago approximately, and it’s a real plus! Thank you TesterTout.com, no more headaches and I feel more confident. A great product for me, who was skeptical and who wanted her husband to test it instead… I frequently had insomnia and night headaches (I sleep with my phone under my pillow). The results were not immediate, but after some days, I’ve started to sleep better and my headaches have gradually disappeared… A fabulous product that I will recommend to people who might potentially need it! At first, I was a bit skeptical, but while using it I’ve noticed that the phone is heating less and the sleep is much more quiet. Practically no more headaches, I am amazed with the result. I’ve noticed that my headaches had decreased since I’ve got fazup. Tremendously effective! I gave FAZUP to my 17 year-old daughter who’s got iPhone 4s and who was often complaining of headaches and tingling… After some weeks of using this product, she has stopped complaining. From time to time she has some tingling sensation, but it's not comparable to what she used to feel before the FAZUP installation. She spoke about it at her physics course as they were discussing the dangerous side effects of the mobile radiation. I've always been worried about her as she is using her cellphone all the time. Now when she has FAZUP it gives me comfort. I plan to buy an iPhone also for myself and I’ll install FAZUP as well, especially as my cellphone is constantly searching for network in the town where I work due to some kind of antenna malfunctioning. Thanks testertout.com for letting me discover FAZUP which I strongly recommend to everybody. I am epileptic as well, but I’ve got nothing important to say at this point… However, my nights are calmer and the phone is heating less. So, thanks! I am also epileptic and I am suffering especially from tinnitus, so I am very satisfied of this test! Thank you TesterTout.com for letting me test this product, once again a wonderful test thanks to you! After some days of testing, I can say that it’s very effective! A good and easy to use product, attractive packaging and less headaches. Easy to use, no more tinnitus and fewer migraines. Hello, I’ve been testing fazup since I received it. I didn't understand a thing in the user guide and it was my boyfriend who installed the patch on my iphone 4. I can’t figure out if I’ve got less headaches, but I’ve started to sleep better and my sleep is more profound even though my cellphone is just next to my bed (it’s my alarm-clock). However, at night I switch on the airplane mode, so I don’t know if it eliminates FAZUP’s protection! Anyway, I keep it, as for now we don’t know for sure if the mobile radiation is safe. Just in case! What is its lifetime? Thanks for letting me test this innovative product. I’ve tested FAZUP on my iPhone5 and the results are really surprising. The phone is heating much less and I have to mention that I’ve had almost no migraines since I started using Fazup. Thank you Testertout.com for choosing me for this test and for letting me discover Fazup. Awesome, but it’s a pity that it is not ‘esthetic’ enough. However, my ear is heating less! I’ve got a blackberry curve 9380 and I’m talking for hours on my way from work. With Fazup I’ve got no more heating of the ear which is awesome!!! Thanks Testertout. I’ve got an iPhone 5 and a small part of the patch stands out from the mobile, but it definitely works: no more headaches. I am completely satisfied, thanks! Tanks for this test, very effective. I declared 2 major types of discomfort, that I have: tinnitus and migraines and they have both been reduced since I started using fazup. 5/5 for fazup, no more migraines. I am epileptic and my doctor approved the product. I’ve installed the patch some weeks ago and I am delighted. I’ve got many health problems with my cellphone: headaches, migraines, tinnitus and other problems. 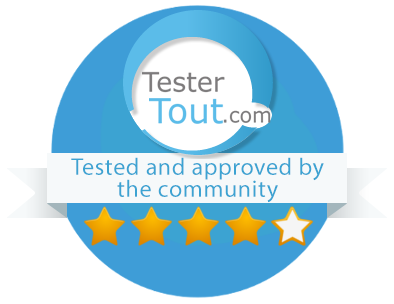 Therefore, this test was very important for me and I want to say thank you to the team of TesterTout for choosing me! I am very satisfied with this test because I found it very effective. Entirely satisfied, as fazup kept the promise regarding health problems that I had indicated in the questionnaire. Thank you, especially for effectiveness regarding tinnitus! I’ve got a 5S. It’s a TOP product because it is simply effective in dealing with the discomfort that I declared in the questionnaire. I’ve been testing it for 3 weeks now, as I installed it straight away after it had been delivered. The was no anti-adhesive stick in my box, but that’s ok as it is not necessary for the correct installation. Anyways, a very good product. I have an iphone 4 and I am very satisfied with fazup essentially concerning my migraines. I haven’t had them for 3 weeks now. Other discomfort that I had is not gone (the phone is still heating, maybe a bit less) but still the results are conclusive. Thank you Tester Tout! I tested fazup on SAMSUNG S3 and got very good results, more precisely no headaches in the morning that really changed my life! Thank you, the test was very good. My phone is not heating anymore and furthermore, my iphone was interfering with my acoustic system and since I have fazup I don’t notice it at all, which shows that patch is really effective. I spend +2H per day on the phone due to my work and I am very satisfied with the product! Sorry for not commenting earlier, I was on vacation last week. I have a 5C by Apple. Thanks for making me discover fazup, I am very satisfied as I noticed real improvements considering discomfort that I had mentioned in the questionnaire. I was waiting for 3 weeks to go by to leave my comment as it took me some days to feel the difference. At first, I didn’t notice any changes, but after some time I felt much better. My waking up is more gentle now as I have less headaches in the morning even though I sleep next to my phone. I’ve got a Nokia Lumia. I am epileptic and I’ve got tinnitus and tingling sensation after talking on the phone, that’s why I was a perfect guinea pig for testing fazup… and the result is very good and I am really happy as I haven't had tinnitus since the day when I installed the patch! Moreover, no more tingling sensation neither! Therefore, I am extremely happy and the phone is heating much less… In conclusion I want to say first of all BRAVO FAZUP as you have a top product and 2° THANK YOU TESTERTOUT as I was not aware of the existence of this type of products and thanks for making me test it. From now on, all my cellphones will be equipped with it! I’ve got an iphone. I am still skeptical, even though the phone is heating much less which is already a good thing. I haven't seen much difference concerning my headaches. Fazup : 5/5 as I have no tinnitus anymore! Fazup is very effective, no more headaches since the day when I installed it on my iphone 5c. On the other hand, it is really a pity that a part of the patch stands out from the mobile because it is unsightly. Anyway, it does not matter, I am using a protection case and its effectiveness is the most important. Good evening. I am very satisfied with the patch as it is easy to install on my iPhone 5s and the phone is heating less than before during my calls. I also have less and less headaches and 2 of my family members expressed a desire to buy fazup which is already not bad ? thanks for giving me a chance to test it. Very easy to install on my nokia Lumia 925. Since I have it on my phone, I noticed that I had less headaches :) And I can have long lasting conversations again ;) I recommend it 100%!! Easy to install on my Samsung Galaxy S; the box was complete. I am very sensible to mobile radiation and I often feel that my ear is heating and I’ve got headaches when I’m on the phone for more than 15 minutes. As I have kids (11 months, 4,5 and 7 years old), I was delighted to find out that fazup eliminated up to 99% of mobile radiation from the maximal SAR value. Frankly speaking, I can’t say that fazup is effective for phone conversations longer than 15 minutes, at least not for me. I want to believe that fazup lowers mobile radiation (as it was proven in the laboratory), but in practice my phone and my ear are still heating, and I still have headaches, although those bad effects have decreased. For your information, I don’t spend hours on the phone and I don’t sleep next to it when it is switched on. Everybody has their own sensitivity, which can explain that it doesn’t affect me much… it should be a good product as I’ve noticed that many people are 100% satisfied… Thanks for making me test this product. After receiving the product, like many people, I was skeptical about its effectiveness. After several days of testing it, I changed my mind: no more headaches!!!! 100% delighted and I recommend it. I was skeptical when I received my box, but after some weeks of testing, I can say that this product really works. I am sensitive to mobile radiation, especially since my children often play with my cellphone. The patch reconforts me, as my headaches disappeared and the phone is heating less. Big thanks to testertout.com and Fazup that I endorsed and have already spoken about it with my friends and family. Everybody is very interested in your product as mobile radiation is a new phenomenon nowadays. I went on with the test and I strongly recommend fazup to all my friends because it eliminates mobile radiation. I have no more headaches, so my sleep is more profound and I feel much better in general. Hello, usually I am skeptical about this kind of products, but this time I am happy. I feel like I have less headaches although I am using my cellphone all the time. It is also heating less. Personally, I had no idea that this kind of product existed, neither did my friends and family. However, it really works, so I strongly recommend everybody to talk about this product everywhere, so that the brand becomes famous. Hello. To me it is actually difficult to understand if this product really works. I’ve got an iphone 4 and fazup was very easy to install. Nevertheless, I’ve been using it for 1 month and I’ve got an impression that I have less headaches and the phone is heating less than before. Thanks for this test. At first, I was skeptical about real effectiveness of the product, but despite that I noticed some positive effects (particularly, less headaches then before) so, I recommend fazup to people addicted to cellphones! Nevertheless, I didn’t find a microfiber cloth in my box for iphone 4s, but it was not a problem. As promised, I'm leaving my comment! After 20 day’s usage Fazup works very well, my husband confirms that he has less and less headaches and the phone is not burning after long conversations, and that IS TRUE!!!! On the other hand, he has some network connection problems, here is the snag!! For all the teachers who spend more than 4 hours a day on the phone, Fazup has to be reimbursed by social security. Thank you for this wonderful discovery. I am rather satisfied, but it is difficult to determine precisely the positive effects. Anyway, I think that it is always a good thing to have such a patch on the phone… thanks fazup! Hello, thank you for this test. I got my fazup box rapidly and after some days of testing, I am not sure of having noticed the positive effects (maybe a bit less headaches, but I noticed that I had problems with network connection since I installed fazup). I have nokia n8 and the edge of the patch has a tendency to rub against my hand. I think it will finish by peeling itself off the phone. I think that it is better to use a protective case with it. It has been 15 days I am using fazup on my iPhone 4. When I received the box I didn’t believe that it could be effective. I asked myself, how this small patch could help me to reduce headaches, migraines, tingling sensation… I applied the mold, installed the patch and continued using my phone as usual. After 3 days' usage I felt less nervous and more relaxed, does it have anything to do with the patch?! But then my headaches started to be less frequent, so did the tingling sensations! I have to say that I don’t know why and how it happened, but I guess that it was the patch, that WORKED! I was amazed… thank you testertout for letting me test this wonderful patch! Personally, I am very happy to have tested FAZUP. I installed it one week ago and I already have less headaches. Now I need to see if they are going to decrease more after a longer usage. Moreover, I always sleep with my phone next to me and I noticed that now I have a better and deeper sleep. Finally, as I have 2 children, who are always next to me and as a result next to my phone, it is very important to me to reduce my iPhone’s radiation in order to protect them. Therefore, it is very good that I was chosen for this test. At first, I was afraid that the installation would be too complicated, but I finally managed to do it right! Me as well, no cloth microfiber inside, but not at all essential. Delighted by the result. Despite the fact that a small part of the patch stands out from my iphone 5, I am very satisfied with this test. To me it is a cool thing to have as I don’t have headaches during and after my phone conversations anymore. The phone doesn’t bother me at night neither. To sum up, tested and approved. I have S3 and I am completely satisfied with fazup. I recommended it to my cousin who works with me, as we are always together in the car. She is epileptic and she was very interested in the fazup patch. Anyways, easy to install, fast and effective against the heating of the phone. Thank you testertout for making me discover fazup. Since I’ve installed it I have no tinnitus and less migraines. I spoke about it around me and my father bought a patch for himself!!! I didn’t notice significant changes. I still have headaches, but I often have them anyways and I also caught a cold, which is partly a reason. However, I keep fazup installed on my iphone 5s to avoid more severe headaches. Very good product, I really felt the difference! Thank you for this device, which is very good for my and my kid’s health. Hello. I use fazup on iphone 4s and it was easy to install, thanks for the instructions!!! I noticed that the phone is heating less and I hope the patch will save me some battery! I have fewer migraines in the morning, thank you for choosing me for this test, I really recommend this product! I’ve got S3 and I am delighted as now I have fewer migraines and I feel safe with all this harmful radiation from wi-fi, microwave ovens, telephone, etc. Hello, the test is over for me. I didn’t see any changes considering my headaches, but tinnitus is not that strong now. I’ve got a Samsung Galaxy Ace. First of all, thank you for my box, I am very satisfied with fazup. I have less headaches now, even though I am on the phone all day long. I recommend FAZUP to everybody as this product is very easy to install on the phone and it really works. Have a good day. Thanks for my box. Since I installed fazup on my Samsung s 3 mini, my phone is heating. Nevertheless, I am satisfied as I have less headaches and tinnitus. Very effective! Thanks for the patch. Hello everybody. Thank you for the box. I’ve got a double sim phone and I didn’t feel anything special during the test, but I can’t say that Fazup is ineffective. I have severe headaches and sleep disorder, so I thought that fazup would help me at least with one of those things. My health problems might be associated with the stroke that I had recently, but since I sleep next to my phone all the time, I hoped that it would work. Now I will install it on my daughter’s phone. She is constantly complaining about migraines that could be caused by the cellphone. I have an impression that my phone discharges faster, but it doesn’t really matter if it keeps me away from mobile radiation. I’ll wait some more days to comment about my daughter’s experience. On the other hand, I don’t criticize Fazup, it might be a very good product and it is just me who can’t benefit from it. That’s why I waited for some time before leaving my comment. I am very aware that I am sick and my symptoms won’t disappear with Fazup, as they don’t disappear with the treatment that I have. I will test it on my kid and will come back with a comment about her migraines or other improvements. As for me, I can’t say anything important. I will come back to you at the end of the test. However, I watched the video on fazup website and it seems very convincing to me. But for now, I have another guinea pig here, lol. Good luck everybody! Gautier, thank you for your detailed comment. Concerning your double sim mobile, what exactly is the model? And is your daughter’s model compatible with fazup? I’ve finished my test of Fazup and I am very satisfied to discover this product. My problems were the heating of the phone and tinnitus, which happened regularly to me. Now the phone is heating less and the tinnitus is gone, which is a real improvement! So, I am very satisfied. I’ve got an iphone 5C and the only damper was that in some places where the connection was not good, it became worse. Anyways, a simple and not very expensive product to improve your health conceived for the device that we use every day. Top! The patch works well, so it is a super product. No more headaches, so I vote 5/5. After my last comment, I don’t have anything else to declare. The patch works really well. Have a good day. Fazup is a very good product for me. Feeling of discomfort that I had very frequently reduced significantly since the beginning of the test, which shows the effectiveness of the product. Very practical, invisible in my protective case and really very effective!!! That is a pure swindle, they have an excellent marketing and that’s all… it is physically impossible to stop the radiation except by installing Faraday cage. Watch youtube videos. Hello. I guess I’ve left a comment already. The patch has no effect… I didn’t notice any changes with fazup. I am suffering from tinnitus for many years (it’s pathological) and Fazup didn’t help me with that, which I consider as a failure. Anyways, it is very simple to install the patch. Thank you testertout.com! Simply effective on my iphone 4s, here is my comment about this high quality and very important product. I am convinced that mobile radiation is no good and I am very often on my phone due to my work. Hello, for me it was easy to install and I think the patch is awesome. Less headaches and the phone is heating less. I am satisfied. Thanks for making me test this product. First of all, thank you testertout for this test, as I was not aware of this product, but I have already tested other products (they were even thicker) and they didn’t work. Fazup is a real success to me as my feeling of discomfort started to disappear. It is very effective for tinnitus! I am epileptic and it is hard to give you more information as I installed Fazup only 1 week ago. I will come back to you with another comment some time later. Thanks again! Fazup 4/5 beacuse it is expensive. Easy to install, but a small part of the patch stands out from the phone. For the rest it's top: iphone is heating much less, no more migraines and I am using my phone more than 3 hours per day. Thank you testertout. I am epileptic and I can say that before Fazup it was a nightmare: headaches, tinnitus and regular epilepsy crises. Since I have Fazup (1 week), no more headaches nor tinnitus, so I feel very comfortable now during my phone conversations. For an epileptic the patch seems to be very effective, especially concerning headaches. Bravo Fazup! I expected better results. No cloth microfiber. I have an iphone 5 and I didn’t notice anything special, nothing has changed for me. There was no cloth microfiber in the box. I have an iphone 5s and the phone is heating less. My sleep is more refreshing and no more migraines. Very effective!! It is practical and easy to install. It’s pity that you don’t have molds for other phone models. I’ve got less headaches, so it seems to work! Good product! Marilyn, for your information Fazup will soon (by the end of June) be compatible with 30 cellphone models. Easy to install, the instructions are clear. On the other hand, I have small problems with connection in the places where the network is weak. Anyways, I noticed that my iphone 4s is heating less during long conversations. Maybe it has nothing to do with the patch, but who knows. Very practical, not difficult to install, top! The heating of my ear have significantly decreased, as well as headaches. I am waiting for a baby in October and I think that fazup is good for him as well. I recommend it. I tested fazup on my iPhone 4s. My headaches have significantly decreased! It is a wonderful product for those who suffer from headaches!! My ear has almost stopped heating. I am satisfied with the product and I recommend it within my circle. Much less headaches, the phone is barely heating my ear. A product to buy. I installed the patch on my Samsung Galaxy s3, and my headaches decreased. I sleep better now. Considering that, I decided that the product was effective, I give it 5/5. I have fewer migraines now, but the small part of the patch stands out from the phone (iphone 5). I recommend it in my circle!! Amelita, if you have an iPhone 5 or 5S it is normal that a small part of the patch stands out. This position is the most effective for this phone models. Fazup recommends to use the protective case to prevent it’s peeling off or wearing down. After 3 weeks of testing, I am leaving my comment. The results are positive. I tested it on my girlfriend as she also has a 4S. She has just got better after 10 days of cruel migraines, which are stronger than mine (that’s why I gave her my patch). She is very, very, very happy and I think I will buy one for myself as the pharmacy, which is next to my apartment sells it. There was no cloth microfiber, but it was not that necessary. I can say as well that I finished my test and I am very satisfied. The only damper is that the small part of the patch stands out from my iphone 5s. Considering the price of this phone, I think that it is a pity, but I will continue using it as it is very good for my health. I felt that tinnitus doesn’t bother me very much and I note fazup 4/5 because it stands out from my phone and because it is quite expensive. I recommend it, as the results are there. I finished the test on my blackberry. Fazup is easy to use and to install. I give it 5/5 However, it is way too expensive. I finished my test on iphone 5C and fazup was adopted. I give it 5/5. The only thing is that it stands out from my phone, which is a pity, but I bought a protective case :) Not a single headache, the phone is not heating anymore and I feel comfortable. Placebo or not, to me it is 100% effective. Headaches have disappeared and considering mobile radiation, that is placebo effect, but I still think that it is effective. Anyways, I am convinced that it works and recommended it to my mum, who has the same symptoms. I have BlackBerry and I think that fazup has a very clear instruction and is easy to install. Above all, I noticed that I have less headaches and a better sleep. I note 4/5 as very effective and easy to install with the molds for iphone. Mo more migraines and headaches, especially in the morning, although I sleep with my phone beside me. However when I am in the area with good network connection, I’ve got an impression that the connection is worse with fazup, that’s why I noted it 4/5. Thank you TesterTout and Fazup! Fazup is Top, as my headaches disappeared. I have a BlackBerry. The phone is not heating anymore and no interference with my acoustic system. I’ve got an iphone 4. Since I installed the patch on my phone, I’ve noticed that it is heating less and my ear is heating less as well when I have long conversations. However, the connection is worse now and I am waiting to see if it will change. I am very satisfied after 3 week’s usage on my 5C. It is a wonderful product, even if the price is a bit high, being in a good health is priceless! ? Anyways, no more migraines and I have no night headaches. I had a positive experience with fazup – no more earache. Thank you fazup, the test is conclusive and I recommend it. However, the product is very hard to find in pharmacies. I’ve been testing fazup for 15 days and I share the most of the comments, that I’ve read here: no more night headaches. However, I didnany changes during the day. I’ll talk about fazup in my circle. It’s true that the result is visible! Less headaches and nausea. Me too, I sleep better and have no more headaches!! Hello, I tested the patch on iPhone 4s and I have no headaches and no tingling in my fingers anymore. It brings me comfort, as my son is also playing with my phone. I am satisfied with this product. Hello, I installed the patch on my Iphone 4 and I don’t see any particular changes. I didn’t have migraines or tinnitus before either. The connection didn’t change as well. Product easy to install. Hello, I tested the patch on my iPhone 4 and I didn’t see real changes apart from the fact that the phone is heating less now. It is easy to use and to install. It is discreet and I decided to leave it on my phone even after the test. Maybe with time I will see real changes, but I still recommend it. Hello, reading users' comments I am surprised and even worried. If the phone is in charge of the headaches, tinnitus and migraines, we should make a point on its danger and the risk for public health. Maybe I am underestimating the placebo effect. In this case, to feel better people just need somebody to tell them that they are being taken care of. Personally, I don’t have any problems like headaches or tinnitus connected to my mobile phone. I try to make fewer calls and use hands free kit. Since I installed fazup I haven’t noticed any changes and I stay skeptical. Moreover, I find it quite expensive and I am sure that the company could have economized on the packaging or on putting several patches into 1 box. However, I have no problems with network connection, my 4G stays on 99 Mbps for downloading and 44 Mbps for uploading. For now I can’t say that the patch is effective. Maybe the Placebo effect really exists, but headaches and risks of mobile radiation also exist, and we are trying to protect ourselves in this situation. It is a real problem and nobody had tried to solve it till now, so protect yourself!!! We don’t have enough data on how our electronic gadgets can be linked to health problems… Let’s protect ourselves!!! Jérôme, it is completely normal not to feel the effect of fazup if you didn’t have problems like headaches and tinnitus before. Nevertheless, you absorb less radiation with fazup, which was tested in an authorized laboratory. Being an expert, fazup showed us numerous scientific evidence of health risks related to electromagnetic fields. Carcinogenic effect of those fields is still not clearly identified, that is why the possibility of cancer development based on electromagnetic waves still exists (2B classification by WHO). Finally, on the website fazup.com you can find a family pack that contains 4 patches in 1 box to lower the purchase price. It is obvious that fazup will praise its own product, they sell it Do you think we are stupid?? Gérard, we decided to make a test of the patch fazup because it was scientifically approved. If this product was a deception for you, I would strongly recommend you to keep calm and stay polite :) If you want, you can leave us a personal message at contact@testertout.com. Hello. I tested fazup and I’ve noticed a connection problem. I didn’t hear very well, unless I turned the speaker on. Thank you very much, best regards. The test is conclusive, as the patch is very effective: no more tinnitus and almost no migraines. Very easy to install and almost invisible. I give it 5/5 and strongly recommend it to everybody. Being an epileptic and subject to tinnitus, I was a very good tester, as my phone and me it became an unrequited love. I give 5/5 to fazup as no more tinnitus since I installed the patch. It is a real victory! I feel much more serene even when I am very tired (which is very often the case, as I have twins who are 4 months old) :) Thank you fazup and Testertout! I recommended the patch to my sister and to my colleagues. I’ve got an iPhone 5S. I tested the patch on an iphone 4, but the network connection was so bad, that I had to remove it. No more problems since. I’ve been using the patch for some days now on my galaxy Ace. It is easy to install and discreet, but I do not see any effects. I installed fazup on my samsung s3 and I didn’t see any particular changes. Only one thing, the connection is better in certain places. Is it related to fazup? I don’t know. Hello, I’ve been testing fazup for 15 days now on my iPhone 4, and here are the results: discreet in my protective case, no network problems, the same connection quality, no migraines, the ear is not heating anymore during the long conversations. I’ve got samsung s3, forgot to mention! I installed fazup on my phone and I think that I have fewer migraines, but I don’t know if it is because of the patch. If that’s the case, it is perfect for me! I installed fazup on my Iphone 4 and for now, I haven't seen any changes. The positive effects of these kind of products can be noticed only with time I think. I installed fazup on my iphone 5 and I’ve noticed small changes: the phone is heating less, the ear is more comfortable. That is already not bad. However, my phone has some connection problems now, but I don’t know if it has something to do with fazup or with my mobile operator…? Yehaan, do you have any other feeling of discomfort apart from the heating of the phone? You should know that fazup could have a negative impact on the connection, if it is already bad. I have an iPhone 4s and the installation was very easy because of the mold, provided in the box. My phone is heating much less, but I’ve got an impression that my battery is discharging more quickly than before. My migraines unfortunately didn’t decrease, but I have less tinnitus. I will continue the test to see, if the changes are long lasting. Thank you testertout.com for letting me test this product. I installed fazup on my iPhone and I’ve noticed that I get less tired, I’ve got no more headaches even though I didn’t change my life rhythm!!! Thank you testertout.com team ! I received my box and easily installed fazup on my iPhone 4 with the help of a mold. I am a person who is passing a lot of time on the phone! Since 2 days I have fewer migraines and I am less irritated than before. I will continue the test to see if there are other results. Thank you testertout. Val, Fazup has no impact on the software of your phone. It is recommended to restart the mobile phone when you have bugs. I installed Fazup on galaxy S3. I noticed that I had much fewer headaches and dizziness. It seems to be very effective. Ingenious product! I did not receive a good patch for my mobile, so I gave it to my friend, who said that the patch was very useful and ingenious! She had severe headaches that have reduced because of the patch. It upgraded her life quality and made the time passed on the phone better. Thank you very much… Fazup concept is original… Easy to install on my iPhone 5. I noticed improvements and now I really think of offering fazup to my dearest people… It is a useful and innovative present! Hello and thank you testertout for making me test Fazup. I received the box and easily installed the patch on my Iphone 4s, following the instructions. It has been a while I am using Fazup and I am delighted: the phone is heating less, so does my ear and I have less tinnitus. I sleep much better now. A product that seems to keep its promise. Hello, I received Fazup. The box was in a good state when it arrived, but there was no cloth microfiber, so I had to clean the phone surface with a simple cloth. For my iPhone 5s it was very easy to install, I was just following the instructions. Simple, effective and discreet. Concerning the test, I am very satisfied. Before installing the patch, I had a disrupted sleep (my phone was always next to me in bed), but since I have the Fazup, my sleep is much better even though the phone is still next to me in bed. From this point of view I am really satisfied, as I have a better, more profound sleep. I also have migraines, but since I’ve got Fazup they became more rare and last time I even survived without Paracetamol. I have also less tinnitus. Concerning the battery, I can’t say that it discharges faster than before. In conclusion: I will keep Fazup on my phone and will recommend it in my circle. I didn’t have cloth microfiber neither, but it is not a big deal. I didn’t understand the utility of molds that were in the box and I didn’t find one for my phone, galaxy Samsung mini, which I mentioned in the questionnaire. Anyways, I don’t see the difference. Melaniec, if you have a S3 mini you should use the mold for iPhone 3GS (don’t confuse it with 3G, which has a completely different position). The correct position of the patch is very important for it’s correct functioning. I’ve got an iPhone 5S and I received Fazup 15 days ago. The packaging was in a perfect state, but there was no cloth microfiber (a factory conditioning default I suppose!?). The position of the patch is quite paradoxal for me as the small part of the patch stands out from my mobile. However, it doesn’t bother me as I have a protective case. After 10 days of intensive testing (I am a salesman, and I am on my phone at least once in an hour, 6 days/7) I noticed that my phone was heating less than before. Before Fazup, I used hands free kit and my hands were heating from the phone ;) I was trying to use the Bluetooth kit, but my battery was discharging immediately. Concerning the autonomy of the battery, Fazup might have had a positive impact. Concerning the network connection, I was waiting for some kind of parasitism, but it does not actually influence it! To sum up, Fazup seems to keep its promise. I want to thank the team of testertout.com for making me discover this product. I’ve stopped worrying about long conversations and some of my friends are looking forward to getting this patch. I have a samsung ace First of all, I think that the kit is very esthetical and the installation process is very well explained. It was easy to install. I have also an impression that my sleep got better. However, I noticed that my battery is discharging faster since I have fazup. I continue the test to see if my headaches will disappear. Patce, you cannot indeed visualize mobile radiation decreasing due to Fazup, but you can watch the video on https://www.youtube.com/watch?v=eKZa7uieal8 to see the mobile radiation tests that were conducted by Fazup in the laboratory. I had an impression that my phone became slower, but I have less headaches and it is discreet and easy to install. Lorie, Fazup has no impact on the software of your phone. It is recommended to restart the mobile phone when you have bugs. I’ve got an iPhone 4 and I had no problems with my phone. I have less headaches and I continue to use Fazup. I have an impression that it works. I haven't had headaches since I installed it. I felt that I had less headaches, but my phone is discharging faster… I have an iphone 4. Difficult to say if it is effective, but my iphone 4 is discharging much faster with the patch. I won’t continue using it. Awesome, because no more headaches, I strongly recommend it to everybody! The battery of my Samsung is discharging slower. Finally, no more migraines, I strongly recommend this product. Moreover, my iPhone doesn’t have any problems with network connection, etc. I’ve been testing it for more than 1 week and the phone is heating less. Except for that, nothing special. I installed Fazup on my Samsung galaxy s3 straight after I received the box. Some days after I had less headaches, which was very pleasant! However, I have connection problems with Fazup (the connection is slow, failure to send a message, etc.). Apart from this, the product is very good and I recommend it for everybody who has migraines. Hello, I had received the box 2 weeks ago, but I installed it only last week. For now, I do not see any difference between ‘with’ and ‘without’ patch. The concept is interesting and innovative. Just one thing: as we can’t measure the mobile radiation ourselves, it is difficult to see the effectiveness of the product. I'm continuing the test and I hope I will have something more to say later on. it is really a genuine concept, I have less headaches and earaches, thank you for this test! Hello, I’ve been testing Fazup since I received the box, because I think that the product is innovative and very useful for people like me! I have severe migraines (4 times a week on average and I have to take special medication to get rid of them) and evening tinnitus, as my phone is always not far from me during the night… I am also worried about the negative effects of the mobile radiation on my health and the health of my nearest people that is why I was impatient to test this product. It seems that Fazup is effective for migraines (0 since 15 days of testing) and my headaches are less severe and I don’t have to take paracetamol or ibuprofen. I feel heaving less tinnitus in the evening, when I go to bed. But more importantly, I’ve noticed that my sleep got really better. Therefore, I am convinced. The quality of network connection stayed the same, so this product suits me well. I also feel safer during my calls, as I know that this product is a result of scientific research and that it was approved in the laboratory. Even though I am trying to reduce the time spent on the phone, it is good to know that I am protected. The only downside was that it was quite difficult to apply it on my Samsung Ace… The patch was too low, so I was afraid it would stick off, and I placed it a little bit higher. 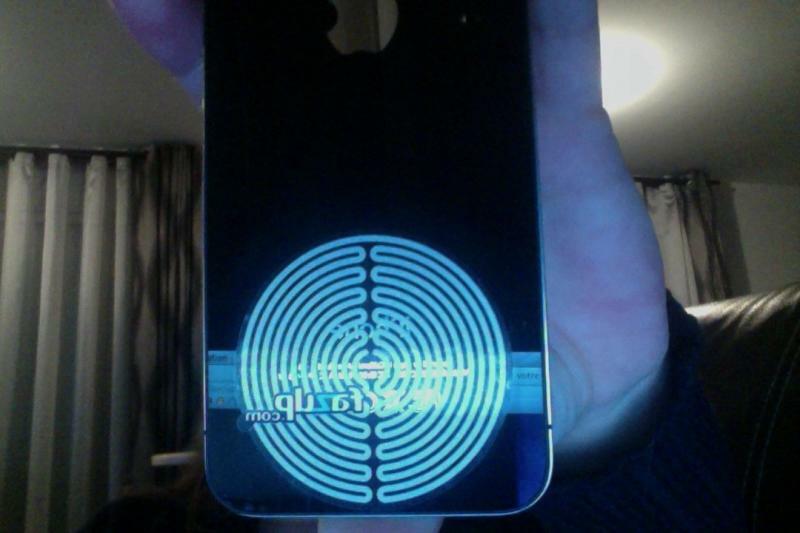 Since then everyone is asking me, what this funny spiral on the back on my phone is… I recommend Fazup to everybody. Thank you for making me discover this advanced, innovative product. Best Regards. It is really a genuine concept! I have less headaches and earaches, thank you for this test! Since I have Fazup on my iPhone 4, I’ve got no more migraines, tinnitus nor mobile radiation! It is awesome ! Honestly speaking, I am very satisfied with his product! My headaches have disappeared, the product is really effective, I strongly recommend it! Honestly speaking, I haven't seen any difference. We shall see if it changes in some days. I tested Fazup on my iPhone 4 and even though I still have migraines, I feel that my head is lighter then usually in the end of the day. My overall impression is very good and I strongly recommend this product to everybody. I didn’t find a microfiber cloth, although it was announced on the packaging. It was easy to install. However, I don’t see much difference between ‘with’ and ‘without’… maybe the fact that the consumer cannot verify himself the effectiveness of the product is a weakness of Fazup. When will Fazup be able to measure mobile radiation? Awesome product, I recommend it to my near circle!! I tested Fazup and for me this product is really effective, as fewer migraines and headaches! I tested Fazup on my Iphone 4 and I haven't felt any difference. I have no problems with the connection. However, I am now sleeping further away from the phone in order to get rid of the morning headaches. Tania, did you use the mold for IPhone 4 correctly? Here is my second comment. I have less and less migraines and tinnitus. I recommend this product. Easy to install, nice design, effective for now. Very satisfied with the product, thank you. I sleep much better now. I am very satisfied with the product. No more network problems and less headaches. I recommend it! Good product that corresponds to the description. After 12 days' usage, I am satisfied. I am very happy, as I used to suffer from headaches, but they were gone with Fazup. I don’t have any connection problems. Hello, I’ve been testing Fazup for 10 days now. My iphone 4 is heating less. I have less headaches, which can be just a coincidence though. The connection is good. Concerning the installation, it is very easy: cut, match, install. I will leave another comment if I notice other positive effects. Hello. I have connection problems with the patch, however I have less earaches and headaches. Thank you for this patch! I am disappointed as I lose the network with the patch. I didn’t feel any difference, so I removed it to have the network connection. After 1 week’s testing I noticed that I had less headaches in the end of the day and less problems falling asleep. I tested Fazup on my Iphone 5s. I don’t see big difference concerning the effects of mobile radiation after the patch installation. However, I hope that the effects from Fazup are useful for health in long-terms. Hello. I got the box 2 days ago and I installed it only yesterday. For now, I don’t see any difference, but I will certainly inform you if I notice any changes. Thanks for this test. Hello! I’ve been testing Fazup for 1 week now and my phone is heating less. Still, I have connection problems, is it normal? I have less headaches, so it seems to me that Fazup is a product that I’ve been waiting for so long! We shall see…!!! Hello! After some days' usage I need to say that this product is not bad at all. First of all, easy to install. Then, I haven’t had a single migraine (and I am used to them), since I installed Fazup. Coincidence or not? We shall see after some time, but nevertheless bravo! hello, my Fazup stuck to my jeans and a small part of the patch has torn. I would like to know if the patch is still functional. Thank you for the photo. After having consulted with Fazup: the patch still works due to induction phenomenon. The tear is not that important to decrease the effectiveness. Nevertheless, we recommend you to protect the patch with a protective case (not metallic), so that it doesn't get harmed any more. No luck! Maybe should you get yourself a protective case? The patch has a lifelong guarantee only when it is protected by the case. You’ve asked a very good questing and while we are waiting for the answer, I hope that the patch works. It was a risk to wear the patch without the case. It is a pity. Hello, after 10 days' test I 'm starting to be more convinced. Ringing in the ear has decreased, when I have long conversations. The same for the headaches, I haven't had them since I installed the patch! It’s been 2 weeks I am testing Fazup. First, it is easy to install, even though the cloth microfiber was not in the box, as it had been announced. I’ve noticed that the network connection became slightly worse, but it doesn’t bother me very much. I sleep with my phone next to me and I have it on me all day long. Nevertheless, I can say that it is easier for me to fall asleep now, I feel more fresh in the morning and I have less headaches. I spend a lot of time on the phone and it used to heat a lot, but now I don’t have such a problem. I’ve been using Fazup on my iPhone 4 for 1 week now. The patch is easy to install and it is esthetical and discreet. Usually I sleep next to my phone, but since I’ve got the patch I sleep much better, I fall asleep more easily and I am less tired in the morning. During my conversations or other manipulations, the phone is heating less. I will see how the situation evolves with time, but for now, 1 week later, I see only positive effects. The patch is a bit expensive, but it is worth it, especially because it helps to improve health. I’ll recommend it in my circle! I’ve been testing Fazup for 1 week on my Samsung S3 and I noticed that the phone is heating less when I am using it (calls, games, internet, charging, etc.). Moreover, it became easier for me to fall asleep, even though I sleep next to my phone. The patch is stylish, it’s discreet and easy to install. I recommend it. For those who have doubts considering the effectiveness of the patch I want to say that it can’t do any harm. hello, the product is esthetical and the positioning system is very well done. I haven’t seen any changes for now, but I have no doubts that it takes time to feel the difference or you just have to be to be a frequent mobile user. I keep the patch installed on my phone, as a precaution against the mobile radiation, which I should keep myself away from. Have a nice day. I was surprised by this beautiful design. I’ve got frequent headaches and my ear is often heating as I spend minimum 4-5 hours per day on the phone. Since I installed Fazup, I feel much better and I will recommend this patch to my friends who have the same problems. Thank you very much Fazup. Very satisfied with this product. I have less headaches at the end of the day. I bought the second patch for my boyfriend’s phone. I am delighted with this patch. It is very discreet and I feel a real difference with Fazup, especially considering the heating of my ear and evening headaches. I recommend the patch to everybody who spends much time on the phone due to work and who wants to feel more comfortable. I am satisfied with this discreet and effective patch. My headaches and migraines decreased and I think that Fazup is a product that works. Fazup is invisible on my phone, because I’ve got a protective case on my iPhone 4s. I haven’t noticed any changes during my conversations, but concerning the rest of the day, the effect is visible. Fewer migraines, no more tinnitus and there are other advantages like the phone, which is heating less. The price is a bit high and I wish it would be more affordable to everybody who has a cellphone. I strongly recommend it in my circle. I tested Fazup on my galaxy s3 mini and I noticed that my frequent headaches have decreased. I hope that those effects will stay during long-term usage. I recommend this product. Hello, I’ve got an iPhone 5s.. I installed Fazup under the protective case, just as it was described in the instructions. I feel that after the long conversations I’ve got much less headaches. Is it due to Fazup?? I don’t know, but for now I strongly recommend it to everybody… Have a good day. I tested Fazup on an iphone 5. The patch is easy to install. I noticed that I have less headaches after long conversations, maybe because of Fazup! I tested Fazup on my samsung ace and I haven't noticed any changes. I tested Fazup on my iphone 4. Very easy to install. Concerning headaches, I will see after a long-term usage. The price is quite high. I tested Fazup on my Samsung S3 and at first, I was skeptical. Nevertheless, I noticed the positive effect – my phone is heating less. The patch is easy to install. I recommend this product. I tested Fazup and I am satisfied with this product. The patch is esthetical and easy to install. My headaches decreased, but at a certain point after a long conversation, my ear is still heating. Thanks for choosing me for the test of this product, it helps me in my day-to-day life. I tested Fazup on a galaxy s3 mini. It was easy to install. I felt that my phone was heating less and I had less headaches. However, I don’t know if those effects are due to the patch. I tested the patch on my iPhone 4 and I am happy, because I have less headaches. For the rest, we shall see long-terms. I tested Fazup on my Samsung galaxy ace and I have less headaches. We shell see in the future if it has something to do with the patch. Hello, I didnt find the cloth microfiber in the box. I have installed the patch correctly on my phone. For now, I don’t see any changes… We shall see on a long-term. I’ve been testing Fazup on my Samsung s3 for 2 weeks now and it is time to ask a question: placebo or not? I feel more comfortable during my conversations, the phone is heating less and my ear is not heating at all. I also have less headaches and I sleep much better (I had disturbed sleep and real problems with insomnia). I am completely satisfied with this product, which corresponds perfectly to my expectations and keeps the promise made. I like the design of the patch, as its silver color matches white phone perfectly? ?The patch is nice, not ugly and I always have a possibility to cover it with a protective case if I want a little change. The positioning guide is also very clear. The only negative points for me are the absence of the cloth microfiber, problems with box opening (the notches are not well cut) and the price (unfortunately too high). I can’t pay 35 (or even 15/20 euros more) for the patch, considering that the lifetime of the phone is very short (2/3 years max for smartphones) even though I use my phones till they break. Unfortunately, it is impossible to reinstall the patch on the other phone. Easy to install. Maybe less headaches now, but I shall see long terms if the patch is really effective. I have less headaches! I would say it works! Thanks for this test. I received the box and installed the patch on my phone. I don’t see any particular difference, as I am using my phone very often. Maybe I will feel its effectiveness after some time. I have fewer migraines and feel less mobile radiation in the public transport. I haven't noticed big changes. Nevertheless, my headaches are less frequent now. I have a Galaxy pro and I've noticed that I have less headaches. I will keep the patch installed on my phone galaxy pro. I’ve been testing Fazup for 1 week and I have less headaches! They are also less severe than usually. I will continue the test to see, if this effect is not purely psychological. Maybe I will leave another comment concerning my headaches in 1 or 2 months! I installed the patch on my Samsung and for now, I can’t say that I've seen any changes. I didn’t have any headaches before, so nothing has changed with Fazup at this point. Nevertheless, I sleep better now and my sleep is more refreshing since I installed the patch. I installed the patch on my iPhone. For now, it is difficult to say if it is effective, but I my ear is heating less now. However, the phone is discharging faster. For now, it is a little bit early to say, if the patch is effective. I’ve got an impression that I sleep better, even though I sleep next to my phone. However, I still have headaches. The patch is installed on my galaxy s3 for some days now and I don’t see any difference. I sleep well and have no problems with the network connection. I installed the patch straight after receiving the box, but it is difficult for me to say that it is effective. For now, I haven't noticed any changes, maybe I need more time? Youyou, do you usually feel any discomfort when using your cellphone? The positive impact of Fazup for certain health issues might need much more time (and your health problems should be connected to the use of your mobile ). Don’t hesitate to come back to us later with another comment. I installed the patch on an iphone 4 of my husband without telling him. We keep the phone on a small table next to our bed because we use it as an alarm clock. We felt directly the effect of the patch, as we slept like babies the very first night with Fazup. We usually have troubled sleep, we wake up often during the night, and a bad quality of sleep in general, it was all gone. After some days, I told my husband about Fazup on his phone and we both noticed that since we have the patch the quality of our sleep is much better. As a result, we are less tired during the day! I am sensitive to the mobile radiation and since I have the patch, my ear stopped heating during the conversation! At first, I was skeptic, even though I’ve seen many people around me with those devices on the phone. I thought that it was pure marketing. Now I’ve changed my mind and I strongly recommend this patch to everybody! I received the box one week ago and I installed the patch straight away. For now I haven't seen any changes, my headaches are still there. I don’t think it functions. Saher, did you use the mold, which corresponds to your phone? I installed the patch on my iphone 4 and it is hard to say, if it really works. I’ve got less headaches, but I don’t know if it is due to the patch. The patch was easy to install, but as with all other protective devices, we can feel the difference only when they are not effective. Still, I’ve got a feeling to have less headaches. Honestly speaking, I don’t see any difference. I am coming back to you after a 15 day usage and I confirm my first comment: the network connection has got worse since I installed Fazup. I uninstalled the patch and the signal came back to the previous level. I easily installed the patch some days ago, even without the cloth microfiber. For now, I haven't seen a big difference. However, I need to say that I am a moderate user of my iphone 4S and I prefer using Apple’s hands free whenever it is possible. At the moment, I would say that I am at least 90% satisfied with the patch! I easily installed the patch on my iPhone 5, but it is hard to say if the patch really works. The patch is designed only for certain phone models and it is not very practical. I tested the patch on my iPhone5. It was fast and easy to install. It is hard to say if it is effective, because I don’t usually feel any discomfort while using my phone. A part of the patch stands out from my iPhone 5, but fortunately, I have a protective case to prevent it from peeling off. I didn’t have a cloth microfiber in the box. Caro, it is difficult to measure the effectiveness of the patch by yourself if you haven't had a feeling of discomfort in the first place. The effectiveness of Fazup is proven during SAR measurements in the accredited laboratory. I invite you to watch the video that shows the mobile radiation measurements with and without Fazup: https://www.youtube.com/watch?v=eKZa7uieal8 Moreover, it is normal that the patch stands out from an iPhone5. Fazup recommends protecting it from peeling off with the case. Adkane, it is true that some improvements might take more time to manifest (in case your discomfort is caused by the cellphone). Don’t hesitate to come back to us later with another comment. I don’t know if this product works, but my Samsung is heating much less. Fast and easy to install thanks to precise instructions. My Samsung s3 has practically stopped heating. I have less headaches since I installed the patch. I’ve tested Fazup on my iPhone 4. It is hard to say, if the patch is effective, as I don’t usually have headaches… It seems to me that the phone is heating less during long conversations. Anyway, I think that the patch is too big and not esthetical and thanks God I have a protective case to hide it. The user guide is very clear and it was easy to install the patch. PS: I didn’t have the cloth microfiber neither. Easy to install on the phone. Concerning its effectiveness, I really don’t know what to say. I’ve got less headaches then usually, but is it really connected to the patch? It’s a very good product and it was easy to install it on my Samsung. I am very satisfied with the result, thank you for this present! This much talked-about Fazup is a very good product. It is fast and easy to install on an iPhone 4. The phone is not heating comparing to its usual state and I am VERY SATISFIED. I STRONGLY RECOMMEND IT IN MY CIRCLE. I installed the patch on my iPhone 5. There was no cloth microfiber, but it was not a big deal. The user guide is a bit complicated in my opinion, and the installation guidelines are not so clear. Still, in half an hour, I installed it and it was not very difficult, I just needed some time. I also managed to put my leather. It’s been 2 weeks now and I can say that the phone is heating much less during long conversations. Moreover, my evening headaches have almost disappeared. This is already a big progress and I think of buying a family pack for my husband and my children. The patch is a wonderful precaution measure, thanks for making me test it! Fast and easy to install. For now, I haven't seen any miraculous effects, but it is true that the ear is heating less during long conversations and the phone doesn’t interfere with other devices. Good product. I’ve got an iPhone 5 and didn’t have a cloth microfiber neither. Just as Ophelie, I didn’t see a comment about cloth microfiber. Does Fazup really work? It seems to me that it does. I felt the difference the very night after the installation. My nights are calmer in spite of the wedding preparations, birthday, new house acquisition and job changing (huge mess). However, is it just a Placebo effect? I hope not. Unfortunately, I can’t measure the mobile radiation myself. 2 negative points: first, the design is not very good. It is a pity to cover my beautiful iPhone 5s with a protective case… and the patch is huge… Second, I have difficulties in catching 3G/4G, as I am crossing the border 2 times a day. The phone takes time to catch the network (French or foreign). That is annoying, because I usually make phonecalls or listen to Deezer in these moments. Nevertheless, I think that Fazup is a good product. Tested on an iPhone 5S. I didn’t have a cloth microfiber in the box, but still installed the patch on my iPhone4. I have less headaches and even though it might be a Placebo, it is reassuring. I feel safe when my 8 years-old daughter stays next to me during my conversations. I don’t don’t how the patch works, but a long-term test will show if it is really effective. I’ve got a Samsung Galaxy S and I found it difficult to install Fazup. I’ve spent 30 minutes trying to understand the user guide. Concerning its effectiveness, I have less headaches. The patch is worth it. It is a pity that I didn’t see this comment before, because when I noticed that the patch stands out from my iPhone 5, I changed its position thinking that I had made a mistake. No cloth microfiber neither. Anyways, despite all, after one week’s usage I’ve noticed that the phone stopped interfering with other devices and I have less headaches. Does Fazup really work? It is quite a delicate product to test… I think that I need more time to see the beneficial effects. However, I feel like I sleep better with the patch and it perfectly suits me! I have an iPhone 5. Ophélie, it is important to reinstall the patch correctly with the mold for an iPhone 5. It was easy to install on my iPhone 4 and I put back the protective case (leather). My 3G is slow now, but besides that, I don’t see any changes! The installation guide is clear. I sleep with the phone under my pillow, because it is my alarm clock and since I installed Fazup I haven't had the morning headaches. My phone is heating less. That is wonderful! I installed the patch on a Samsung galaxy s3. Easy to install, but the patch is neither esthetical, nor discreet. I’ve noticed that my phone was heating less and it is easier for me to fall asleep now. Is it because of the patch, or there is another reason, I don’t know. The quality of my network connection didn't change. Generally, I am satisfied. The changes are not that obvious, but still present. Easy to install on my iPhone 4, cool design (even though I use a protective case). Concerning its effectiveness, the phone is really heating less. I am less tired after long conversations and have less headaches. The quality of network connection and other phone functionalities didn’t change. The box was complete and the installation guide was clear, enabeling to install the patch without any trouble. Even though the patch is not miraculous, it is directly effecting my everyday life in a good way. The patch was fast and easy to install on my iphone5s. I don’t have a tingling sensation in my ear anymore and the phone is heating much less during my calls. Easy to install on my iPhone 4. Nice design. I have an impression that I wake up less in the middle of the night. Still, I am asking myself if the quality of my network connection changed. Olivier, if the quality of network connection is not good around you, Fazup can have a supplementary impact on this quality. However, without Fazup you receive more mobile radiation when the connection is bad. I’ve got a Samsung galaxy S3. The phone stopped heating during long conversations. Fazup is also easy to install. Fast and easy to install on my Samsung. I haven't seen any significant changes for now apart from the fact that the phone is heating less during long conversations. We shall see… Anyways, happy to have tested this product. I haven't really seen any changes. Top. I feel much more comfortable now using and being around my phone. I have no headaches since I installed the patch. I received the box and the patch was easy to install. I hadn't had felt any discomfort before, so I didn’t see any changes. Anyways, we should protect ourselves better. I’ve got an iPhone 5. I haven't seen any big changes, but my ear is heating less during the phone calls. The patch was easy to install and the overall presentation is nice. No more headaches since I installed the patch, so I am in a better mood :) all the family is thrilled! Fazup was a revelation for me, as no more headaches or migraines! The phone stopped heating my ear during long conversations! I am completely satisfied with the patch on my blackberry. Fazup is easy to install. The box is of high quality, and I like the packaging. The patch gives my phone a nice techno touch, even though I use a silicone protective case. I am epileptic and I haven't had a single epileptic fit since I have the patch. The test is conclusive for me and I have already recommended Fazup to my friends and family, especially to my brother who is epileptic as well. The quality of network connection hasn't changed. I received the box and easily installed the patch on my iPhone 4s. There was no cloth microfiber, but I used a simple cloth to clean the surface of the phone. I put my protective case back on after the installation. I didn’t see any significant difference, apart from the fact that the phone was heating less during long conversations. I sleep next to my phone because it is my alarm clock and since I’ve got the patch, I sleep better and my morning headaches are less present. I think that Fazup is a real discovery for those who are sensitive to mobile radiation. Hello, I’ve tested Fazup on my iPhone 4 and I am very satisfied. Thank you TesterTout and Fazup!!! It is not that easy to install and not very esthetical. Is it effective??? Hello. I’ve tested Fazup on a Samsung and I sleep much better, and also have less tinnitus. However, I don’t know if it is the effectiveness of the patch or the weather that is getting better. I’ve got an iPhone 4s and I sleep next to my phone, because it is my alarm clock. I need to say that I sleep much better, I have less headaches and my ear is heating less during long conversations. To me this is a success. Thank you TesterTout and Fazup! The patch was easy to install. I didn’t see big changes apart from the feeling that my ear was heating less. I’ve got an iPhone 4s and I had to take off the case, because it was not compatible with the patch :( I didn’t see any significant changes, but my ear is definitely heating less during long conversations. However, the connection got slightly worse and it is a pity that I can’t use my old protective case. Delphine, all the protective cases except for the metal ones are compatible with Fazup. 6 days after my fist comment and I still don’t see any changes. Before having installed Fazup, I put my Iphone in the airplane mode for the night. I didn’t sleep well otherwise. The patch has the same effect, I have calm nights. Is it an accident? I will see in the future. Honestly, I cannot say if this product is effective, because it is just a patch to stick on the backside of the phone… I don’t feel anything… I can’t say if it is effective. I was perplexed by the idea that this patch really worked. Now I can honestly say that my ear is not heating anymore and I’ve got no more headaches. It's magic!!! Moreover, my ear is not heating as intensively during long conversations. I dont know if it is a coincidence, but since I have Fazup my headaches don’t bother me anymore… therefore I recommend it without a doubt!!! I’ve had regular migraines and headaches, but now I can say that this product is really effective. Almost no headaches since I installed the patch! I am very satisfied and I strongly recommend it to everybody! Hello. The packaging is very nice, but there is one negative point – there was no cloth microfiber in the box (which was announced), but it is not very important. The installation is relatively simple, but I don’t think that the patch looks nice on my iphone 4s. I have a transparent protective case and the patch is really visible. The quality of network connection is already low at my place and the patch makes it even worse. I didn’t see particular changes, except for the phone that was heating less. I’ll see with time, if this ‘gadget’ is effective. When I was talking on the phone, I felt indeed that my ear was heating less and I have less headaches. On the other hand, the patch is not very practical, because I cannot use a protective case with it. Finally, the quality of network connection is lower with Fazup. Julia, as long as the case is not metal, you can use it. I did not see a big change except from the network connection, which got worse. The rest is ok. I sleep better and have less tinnitus. On the other hand, the design is not very appealing. Hello, I have less headaches and my phone is heating less than before. For now, I haven't noticed any flagrant changes. “With” or “without” feels the same for me. However, the product is simple and easy to install. I am very happy with Fazup. I have no more tingling sensations in my hand while I talk on the phone and it has almost stopped heating. Thanks again for choosing me. Hello. I have migraines and I pass a lot of time on the phone… I have significantly less headaches. My phone is heating a lot, because it is broken, it has nothing to do with the patch. I feel the difference. Thank you Fazup. I tested Fazup on a Galaxy Ace 2. Since I installed the patch, the apps on my phone open very slowly. Unlike other users, my phone keeps on heating, I still have a tingling sensation in my hands and my migraines are not gone. For now, I have nothing good to say! I use my phone during the day and in the evening. My ear is heating much less and I have less headaches. I sleep next to my phone and since I have the patch, I feel more refreshed in the morning. The feeling of being protected brings me comfort and since there is a lot of worrying information about mobile radiation, I am glad to be protected! Galaxy s3. I’ve got less headaches and my phone is heating less! I recommend Fazup without a problem! Thanks!!! I live in a place where the network connection is very bad, that is why Fazup disappointed me so much. Since I installed it (surely easily) on my BlackBerry, the quality of my quasi-inexistent network has lowered. Except for this bothering fact, it reduces weird sounds on the line while I talk. The patch seems to work and seems to reduce “bad electromagnetic waves”, but lowers the connection quality in return. I hesitate whether to keep it or not, because this coin has two sides. It seems to me that the phone has a better connection and it is heating less! I am delighted! Easy to install, but I had to peel the patch off soon after, because my galaxy s3 had almost no connection. It was a bit annoying! That is why I don’t have any opinions about its effectiveness. The phone is not heating as much as before. The patch is easy to install and is very pleasant to one’s eye. I’ve got no more headaches, thank you! Top product, you can try it! The patch really works. I tested Fazup on my Samsung Galaxy ace 2. I am using the phone a lot and I noticed that it stopped heating during long conversations! Moreover, the quality of my sleep has improved, even though I sleep next to my phone (it is my alarm clock). I also have fewer migraines. Therefore, I am completely satisfied! 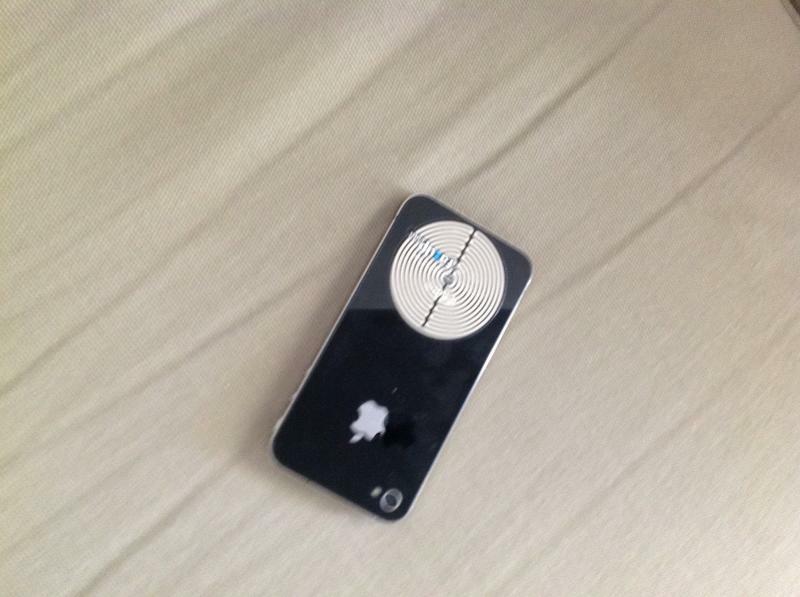 An iPhone 4. Since I installed the patch (1 week ago), my ear is not heating anymore. I also have a subtle feeling of pressure on the backside of my phone (like two magnets which are rejecting each other). It is not a bothering, but a new sensation, as if my phone is holding back something that wants to get away. To me it is a sign that the product works, even though I don’t know how the patch functions. On the other hand, I noticed that the quality of connection happened to be extremely low last week (sound distortion). If those effects depend only on network quality, I will ignore them, coincidences happen. My impression of the patch is finally quite positive. Thank you and I wish you good testing. The protection from mobile radiation is an essential topic of public health. I have a Samsung. I spend a lot of time on the phone and on the 6th day of usage, I’ve noticed that I had no more headaches in the evening and the phone was practically not heating at all. This is really cool! Thank you Fazup! Here is my second comment on the patch. I still don’t see any difference… Maybe I am just not sensible to mobile radiation, I don’t know… Therefore, I don’t have neither a positive, nor negative opinion. However, the product is very easy to install and the presentation is classy. The phone has stopped heating, but I still have headaches. Thank you. The product is easy to install, the packaging is nice. I installed the patch on my iPhone 4S and I noticed that the phone was heating less during long conversations or 3G usage. On the other hand, I still have headaches. I have a Samsung and personally, I didn’t see any difference. I can’t say if the patch works, but I was delighted to try it. Thank you! Easy to install on an iPhone 4s and less headaches after long conversations. I’ve got a Nokia N8 and here is what I think about Fazup : The patch works very well, as the phone is not heating any more ?It is also easy to install on the phone. I am very happy, as I have no more headaches, while using my Wave by Samsung. Thank you Fazup from someone who uses the phone a loooooooot!!! I’ve got a Samsung S3 and since got Fazup I am very satisfied because of something essential to me: I've had no epilepsy crisis for 3 weeks now! Moreover, I don’t have tinnitus anymore! I give 5/5 to Fazup and their patch anti SAR. Thank you testertout for this real and effective discovery! Hello, I’ve got an Iphone 5 and I am very satisfied with Fazup. Thanks for letting me test this product. I am very satisfied with Fazup and I strongly recommend it to everybody I know. Noe, I invite you to visit the website fazup.com where you can find all the lab tests together with medical recommendations. Noe, here is what we found in FAQs on fazup.com website and I hope it will answer your question.The Fazup patch contains a passive antenna that interacts with the integrated antenna of the mobile phone. Fazup modifies the spectrum of radiation of the mobile phone in order to reduce as much as possible the emission of radiation towards your head when you call, and towards your body when you carry your phone on you (a protective screen). As each mobile phone is conceived differently, the correct positioning of the patch is essential and must be very precise in relation to each model of compatible mobile phone. For this reason, Fazup provides an exclusive system of ‘positioning cases’ which guarantee the optimal protection as validated in laboratory conditions. Unlike other devices, Fazup does not redirect the radiation towards the back of your mobile and does not increase the radiation on other surfaces. For this reason, Fazup can protect without exposing other body zones to radiation, or exposing other persons in your immediate vicinity. I have an iPhone 4 and I pass a lot of time on the phone due to my profession. Indeed, I have less headaches!!! I dont make many calls, so I didn’t see much difference. Nevertheless, I am very happy to have installed this patch, because I use 3G very often and I feel more confident now. The patch is easy to install, but I didn’t have a cloth microfiber in the box. I’ve got a Samsung Galaxy S3 and the patch was easy to install. I sleep next to my phone and I feel that I have less morning and evening headaches. I am satisfied with the product. I’ve got an iPhone 5 and i’ve noticed that the battery was discharging faster than usually. However, I’ve got no more morning headaches, even though I sleep next to my phone. I think that the battery discharges faster because your phone is constantly searching for network or wi-fi, and Fazup is there to reduce mobile radiation. Valentin, Fazup reduces SAR and that does not imply the reduction of the quality of Wi-Fi or network connection. If the quality of connection is already low, Fazup might have a supplementary negative impact (if it is not due to a metal or magnetic protective case). Hello, I never use a protective case. I find it useless, because it damages the phone. Moreover, I would be surprised to find out that this is due to the case. I thought that I could give my opinion on this subject and I tried to do it, but I failed… I know what I am talking about, after all! Hello, it’s been 1 week I am using Fazup. I don’t need to sleep with the “airplane mode”… no more usual headaches. The snag is that the battery is discharging faster, but it might be connected with the the fact that I was on vacation. To be verified with excessive phone usage. Since then I had the reception problem only once. The product should be effective. Fazup was easy to install on my iPhone 4. My ear is heating less during conversations and I feel like I've been having less headaches. I’ll be waiting for long-term effects, but for now I’ve got a very good impression. The installation on an iPhone 5 was not very easy. I feel like I've been having less headaches and my ear is heating less, which brings me comfort. I appreciate it. However, I noticed that the quality of SFR network connection was reduced. Despite everything, I am generally satisfied. Bravo Fazup, which takes steps towards protecting public health from the impact of smartphones that are unfortunately harmful. Installed on an iPhone 4s. I am impressed by its effectiveness, as my ear stopped heating during the calls and I sleep better. There’s been 15 days the patch is installed on my Blackberry. It was easy to install and I’ve got an impression that my ear is heating a bit less and the battery is discharging a bit faster. I'm continuing the test. It was easy to install on my 5S. After using it for a few days, I noticed that my ear was heating less, but I will come back with another comment after my next long phone conversation. I installed Fazup on my iPhone and I find it very effective. After some time of 24/7 usage I can confirm its effectiveness. At frst, I was skeptical considering the positive effects, which were announced by Fazup. Today I am completely convinced. I love this product and I strongly recommend it to everyone. Moreover, it is beneficiary for your health… have a good evening everyone. I easily installed Fazup on my iPhone 4, it was not a big deal. After testing it for a few days, I noticed that my ear was heating less (the one that I use when I hold the phone) and I’ve got less headaches, especially at the end of a busy day (when I was using my phone a lot). I will continue the test to see if those effects are long-term ones. I am very satisfied and people around me are very interested in this device, waiting for it to be made for other mobile phone models. I am using a galaxy S3 and I have less headaches and no more tingling sensations… I’ll see with time if those are long-term effects. Moreover, my phone is not heating anymore. However, I have completely lost network connection in the places where it was already low… I don’t know if it is because of the patch. I am satisfied with results. I’ve got a Samsung galaxy which is heating less during long conversations. I’ve got less headaches as well. This patch is awesome, it is really effective! No more ear heating and headaches. Hello, I’ve got an iPhone 4 and I’ve been testing Fazup for some days now. My ear stopped heating a lot during long conversations (more than 2 hours non-stop) and I have less headaches, even though I sleep just next to my phone. I will continue testing it to see if those are long-term effects. On the other hand, the quality of my connection has significantly reduced (the network was not good in my apartment in the first place, and now it got worse and is sometimes inexistent). I carefully used the mold for iPhone 4 during the installation. Do you have any information on this subject? Finally, I think that I need more time to be objective and to describe the real effects from the patch. Nevertheless, my husband wants to buy Fazup for his phone as well. Thank you. If the quality of connection is already low, Fazup might have a supplementary negative impact (if it is not due to a metal or magnetic protective case). You should know that without Fazup and with low connection quality, your exposure to mobile radiation is maximal. You should think of switching to the mobile operator, which has a better coverage in your geographic zone, or of installing femtocell internet box (that delivers supplementary 3G network for better connection). I'm coming back to you after 2 more days of testing. The network connection is indeed of a lower quality now, but I will try to find a solution if that is a question of my comfort. For now, I am happy to see the effectiveness of Fazup regarding the number of hours that I spend on the phone each day. Moreover, I have a protective case that hides the patch, which is good because Fazup is not very esthetic and quite visible. Finally, not a single headache despite huge workload during the day and my little daughter in the evening. For now, I am convinced that the patch is really effective and I recommend it in my circle, even though people are a bit skeptical, they will embrace it sooner or later. Personal health is above everything and if Fazup brings comfort, people will adopt it. Thanks for making me test this REVOLUTION. Very easy to install on my iPhone. My ear is not heating that strong and even though my phone is on the bedside table all night long, I don’t feel tired in the morning. At first, I was skeptical, but one week after I was willing to confirm certain improvements: my regular headaches had become weaker and less frequent. I can now say thank you Fazup!!! ok, awesome. I am now visiting their website to transfer the link to my sister. Thank you for testing this effective product! Hello. I just wanted to add that the cloth microfiber is very effective in cleaning the screen. Concerning Fazup, my sister decided to buy one for herself, because she also has a feeling of discomfort while using her iphone and my test convinced her. Hello, after one week of testing I haven't noticed any difference. However, the patch is easy to install. Hello, the patch was very easy to install on my galaxy ace and I don’t have the heating sensation in my ear anymore. My headaches are also less frequent, so for me the patch is helpful. Very happy, because I don’t have a tingling sensation in my ear anymore, even though I sleep just next to my phone. Very easy to install! Thanks again. It was very easy to install the patch FAZUP on my iPhone 4s (I didn’t have a cloth microfiber in my box, but I cleaned the surface with a simple cloth and the patch was glued to my phone very well). I am using my phone very often due to my work and I leave it under my pillow at night to be sure that I don’t miss an important call. I haven't seen miraculous changes with Fazup, but I sleep better now. I don’t wake up feeling tired, since I’ve got the patch. I still have headaches (maybe less than before), but since I installed Fazup I feel more secured. I recommended it in my circle and everybody is convinced that the patch is very useful. Hello, I have less headaches and I am less tired in the morning. Moreover, I feel safer when I have my kids around. It was easy to install on an iPhone 4. I sleep next to my phone because it is my alarm clock. It is difficult to identify all the benefits of the patch, but I am less tired in the morning. I feel more secured with the patch. Excellent and top product, I was really surprised. I feel less mobile radiation with my iPhone 5s. After installling the patch, I was surprised by its optimal position on my Iphone 5C. I started to use the phone and carefully observe. I use a protective case with holes, which I bought at Apple store (iPhone 5C – black case). Unfortunately, I haven't noticed any improvements, concerning the mobile radiation (above all, the tingling sensation in my hand). I’ve tested the patch on my iPhone 5s. Usually, I turn the airplane mode on before going to sleep, but I decided to play the game and left my phone turned on all night long to see if there is any difference… I feel the negative aspect of mobile radiation less. Satisfied to have discovered this product. I sleep better and I am not afraid of sleeping with the phone in the bedroom. Excellent discovery! Fascinating… honestly speaking, I didn’t believe that it worked, but I played the game and after an easy installation, I’ve noticed the following effects: no more headaches and calmer sleep (I sleep next to my phone)… very happy to have tested this product!!! Easy to install on the phone. It’s been 10 days since I have the patch and now I'm noticing that I have much less headaches. It is a very effective product. The installation is a piece of cake. I have less headaches and I am satisfied with the product. Moreover, it very discreet on my iPhone5. The product is very easy to use, the packaging and the user guide are perfect. Very happy to use it and to participate in this test (I have a Samsung galaxy). I’ve installed Fazup on my iPhone 4s 1 week ago and since then I have less tingling sensations in my hand and less headaches. However, after having installed Fazup, my phone bugged and I had to reinstall my entire music and photo library. My phone is now heating more than before the patch installation. I will continue the test for some time longer, but if the bug problems and the phone heating won’t be gone, I’ll have to peel the patch off. I will still recommend it though. After some days, I have less tingling sensation in my hands, which makes it more pleasant to use the phone. I installed Fazup on my iPhone 5 10 days ago, and only after the 3rd day I felt clear and important improvements. My ears are alive again and I have no more headaches!!! However, 1 hour after the installation of the patch my phone was bugging for a few minutes. It switched off and started heating a lot. It has never happened before, but I’m telling you this, because I don’t know if it was the patch that made this happen. 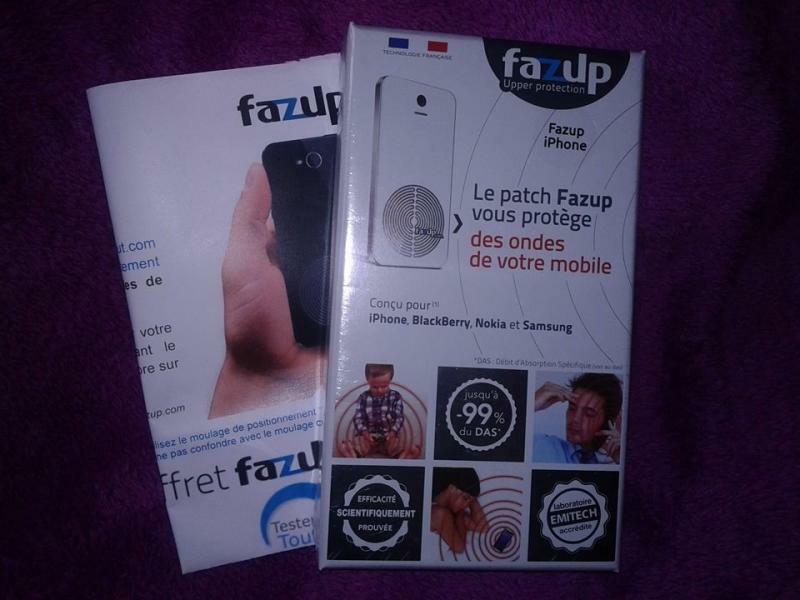 Hello, I received the complete box Fazup (with the microfiber) and it was easy to install on my Samsung S3. I have been testing it for 8 days and I feel big changes: fewer migraines and no more ear heating, even though I am spending much time on the phone. Very happy to have tested this product, that I strongly recommend. Thank you for making me benefit from it. I will come back to you later. Since I installed Fazup on my iPhone 4, I have fewer migraines and less ringing in the ears. On the other hand, I have problems with the quality of the SFR network connection. Regardless of this fact, I am keeping the patch and I recommend it to my friends. I was delighted to test this product. Hello, I have no more migraines since I installed Fazup on my Samsung S3, even though I spend a lot of time on the phone. There is just a small damper – the quality of the connection is worse. I recommend this product. Thank you for letting me test it. Hello, the test of Fazup was very successful to me! I’ve got an iPhone 5C and I usually suffer from tinnitus and deafness. During this test I’ve noticed that I have less earaches after long conversations. I use the phone a lot due to my profession and I can say that now I have less headaches, which is a big advantage… I wanted to point at the absence of the cloth microfiber, but after reading some comments about it, I understood that those clothes were out of stock, so I have nothing bad to say! Thank you for making me benefit from this patch, my head and my ears are grateful to you! I strongly recommend this patch! I would like to know if I am the only one not to receive the cloth microfiber. Hello, I received the box Fazup one week ago. I didn’t feel the effects straight away (I was wondering if it was caused by the absence of the cloth microfiber, because I might have insufficiently cleaned the surface of the phone before sticking the patch). After 2-3 days of usage I’ve noticed that my ear is not heating that much and my night migraines are less intense. Therefore, I think that the patch is effective even though you might need some time to feel the positive effects. I’ve got an iPhone 4. Kind regards, B.
Hello. Thanks again for this test, which helped me with my headaches and earaches. I had those symptoms before installing Fazup and I see that it is really effective. My conversations are more pleasant and less painful now, because my ears are not heating anymore and I have less and less of this tingling sensation. Moreover, no more headaches after the end of the conversation, which is highly appreciated. It was easy to install and the user guide was very well explained, so I have only positive impressions. I strongly recommend Fazup. Hello everybody. First of all, I want to thank the TesterTout team for choosing me for this honorable test. I’ve got an iPhone 5S and here is what I’ve noticed: the box was complete, the user guide very clear. I followed the guidelines and succeeded to install the patch in the right place. However, the small part of the patch stands out from my phone, but I have a protective case. Some positive points: no more migraines, no more earaches, I sleep better, Internet is faster. However, I’ve got a big connection problem with Free Mobile, but I guess it has nothing to do with the patch. I hope to be chosen to test other products in the future. I will tell my friend and family about Fazup Thank you for taking care of the health of citizens. Thanks again for this test and for choosing me. I received the patch for my Samsung some days ago. For now, I haven't seen any positive changes. It is surely because I’ve been suffering from tinnitus for years. Anyways, I found the user guide very clear, the product is easy to install on the backside of the phone. Thanks for making me test your products. I’ve got an iPhone 4s and since I installed Fazup I’ve got no more headaches and the ringing in the ears is less frequent. Thank you for this patch! My mobile is heating less and I have no more headaches. 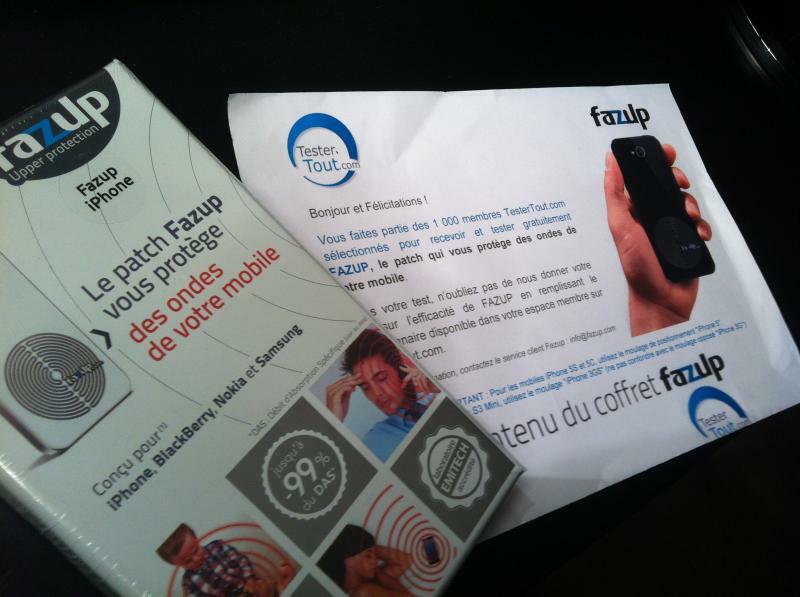 Concerning mobile radiation, the patch Fazup enables my phone tu be used in a better way. Frankly speaking, it is a true revolution in terms of our contact with the electromagnetic waves. The patch is very easy to install, the user guide is very well explained, it doesn’t disturb me when I use the phone and it is quite discreet. I recommend it, very good product and thank you for choosing me for this test. Since I’ve got Fazup, I have no more ringing in the ears after a long conversation (with the ear next to the phone for hours). Since I sleep next to my phone quite often, I’ve noticed certain improvements with FAzup. However, the patch has deregulated the installation features of Bluetooth in my car and I have to redo all the manipulations every time I want to use it. Despite this, Fazup made me forget my hearing discomfort and headaches. That is why I strongly recommend it! Since I received the patch (1 week ago), I noticed that I have no more migraines in the morning, even though I sleep next to my phone in case of emergency. I am satisfied. I strongly recommend this product and I have already spoken about it to people around me. Everybody was curious about this patch on the backside of my phone. Fazup is really effective. I’ve been using it for 1 week now and I noticed a clear improvement of my sleep. I 'm thinking of buying the patch for my family members. Thank you for choosing me for this test. Fazup’s userguide clearly explains the installation of the patch, so it was not a problem. The patch was easy to install on my iPhone 4 and once it is installed, it doesn’t bother you at all. During the test, I noticed that my headaches became less frequent and less strong. I sleep better just next to my phone, which is switched on! Finally, I want to say that this printed circuit really works and now I would like to buy a protective case to improve the positive effects! Thank you TesterTout and Fazup, the product that I recommend! Thank you Fazup, my ears and head are much better now! Easy to install and ergonomic. I recommend it! I received the patch and easily installed it. Fazup is very effective; straight away, I noticed that my headaches stopped and I sleep much better. I find it very effective and recommend it to everybody. After having received the patch Fazup I managed to easily install it. I tested the product for one week, but I didn’t see a big difference. I still have my headaches and difficulties to fall asleep… I stay skeptical. Thank you for communicating us the model of your mobile and the mold that you used to install Fazup. I am very satisfied with Fazup, which I received 10 days ago. After having installed it on my iPhone 5, I noticed that I had less headaches and the quality of my sleep improved. I use my phone a lot during the day and I think that the benefits of the patch will be more visible with a long-term usage. I am delighted and I give it 5/5. I recommend Fazup because this product really works. At first, I didn’t believe that it worked… After having tested it for some days, I noticed the difference. I feel less discomfort. I recommend it. I’ve been using Fazup for more than 1 week and I haven't seen a big difference, apart from the fact that the quality of connection is lower and the battery discharges faster. On the other hand, neither less nor more headaches. Concerning the health benefits, I could say after a longer period of time. I’ve got an iPhone 5S, so I used the mold for iPhone 5S. The installation was very easy by the way. Hello, I received Fazup one week ago and I didn’t think that it could really work and be effective. However, I was pleasantly surprised of the patch, because I’ve got no more headaches or ringing in the ears. I give it 5/5, because it conquered my heart. Thank you for making me discover this product, I strongly recommend it to all of my friends. Hello. At first, I was hesitating, but then I was surprised by the zen and relaxing effect of the patch. The tingling sensation is gone and I feel more comfortable because I know that my children and I are protected from dangerous electromagnetic waves. Effective. I received the patch 1 week ago and at first, I was quite skeptical. However, to my surprise I REALLY noticed the difference: my phone is not heating and I have no more tingling sensation when I’m using it. Moreover, I stopped having headaches. I also feel more serene when my son is touching my phone. I RECOMMEND. Personally, I found it quite difficult to install the patch. I still have difficulties to fall asleep (frequent wake ups), maybe just slight improvements. I will see with time. Hello everybody. To my surprise, I still haven’t received my box. Am I the only one?? Sipertitia, it is not normal, send us a message. After more than 1 week of testing, I can evaluate the effectiveness of the patch for my phone: it is discreet and easily unnoticable. However, concerning the effects, I haven't seen any difference. Mobile radiation is the same with or without the patch. I will see with time. Larabis1, the patch reduced the quantity of mobile radiation ABSORBED by your body. Its maximum amount is defined by SAR (specific absorption rate) and was measured in accredited laboratory. Concerning the effects, do you often feel any kind of discomfort when you use your mobile phone? It might take 1 or 2 weeks to feel the improvements. I am very satisfied with the product! I recommend it! I have no more headaches. I’ve been using Fazup for 1 week and I can say that I clearly have less headaches. I think that the packaging is very nice and attractive. Concerning the installation, the user guide is very well done, the guidelines are clear. However, I would prefer to have the molds already cut, because I put myself in customer’s shoes and what I would want is to install the product straight away after the purchase. We must admit that we don't always carry a pair of scissors. The cloth microfiber that was in the box is very effective to clean the application zone before installing FAZUP. The patch is easy to install and difficult to get peeled off, however in my case (I use my phone for hours) any patch will peel itself off. I need to test Fazup in long-terms, because for now I haven't noticed all the benefits that it brings. I am very sensible to mobile radiation and I felt that I have less headaches since I started using Fazup. Only for this, I will give it 5/5 and recommend to everybody. After one week of very intensive usage and being a telephone addict (fb, games, chat, conversations..), I am very happy with this product. My ear is not heating anymore and I have no tingling sensation during my calls!!! It was very easy to install on my Samsung and I didn’t suffer from any connection problems. Therefore, I recommend this product. To me, it is effective and it brings me comfort. I recommend it to everybody, because with all those electromagnetic waves around (Wi-Fi, Bluetooth, microwaves, telephones…), we could never be enough careful. My opinion about Fazup: the packaging is very nice, the installation is easy, even though you should cut the molds before positioning. The most important thing that I noticed after one week of intensive usage (I am a salesperson and I am constantly using my mobile) is that my epilepsy crises haven’t bothered me since I installed the patch. This is wonderful, because I have them quite often and their strength depends on the degree of my fatigue and maybe even on the intensity of the cellphone usage (my doctor says that nothing is clear on this subject). Anyways, regardless an extremely busy week, I had absolutely nothing! Therefore, it is a very, very, very good point. Another thing is that my ear is heating a lot. Here, as well, a super product. Even though I use a hands free in my car, most of my phone meetings take place on the parking lot and that is where I got convinced! My phone is still heating (which is normal, when you speak for more than 1 hour), but it is heating much slower than usually. Headaches: nothing special to say on this subject. Tingling sensation: the product successfully eliminates it. 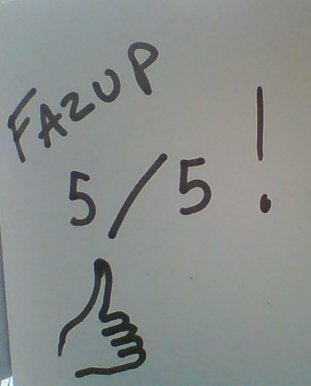 To sum up, I give Fazup 5/5. Thank you TesterTout for making me discover the product that I would not have known without you. No big changes. I will see with time. I noticed an improvement, my ear stopped heating and I don’t feel being exposed to mobile radiation a lot anymore. The product is effective!!! Thank you. Wonderful product, I am satisfied. This is a high quality product. I received Fazup this Friday and since then I haven't had any headaches or sleep problems. Very good product! Thank you very much! Very good product. I felt a real difference after the installation of the patch. Hello. I have a smartphone for some years now and I noticed that I had frequent headaches in the evening and I have a troubled sleep (frequent wake ups)… Since I started using Fazup, I’ve got practically no headaches and I sleep much better!!! I am very satisfied and I am deeply grateful to you for making me test this patch. I was really surprised by the effectiveness of the patch, even though at first I was skeptical. I am using the phone a lot and the effects didn’t take much time to show up. After 6/7 days, my ear stopped heating and I stopped having evening headaches. I am happy that I was chosen for this test. Thank you very much. I received the box and the product surprised me both with its effectiveness and with aestheticism. The phone is not heating anymore and evening headaches are gone!!! Very satisfied. Good product. Effective for sleep problems and headaches. Super product! No more headaches, ear heating and the wake ups in the middle of the night! Thank you very much!!!!!! I received Fazup and installed it on my BlackBerry Bold. For now, I don’t see any changes, I will see with time. I received my Fazup on May 23rd and I straight away installed it on my galaxy s3 mini. I noticed that my phone was heating less than usually and my network connection got interrupted (comes back to normal quite fast). For now, I am satisfied with the product. I will see with time. I received the box. I noticed that my ear was heating less and the network connection loses its quality from time to time, although it returns to normal quite fast. I continue the test to see the long-term effects. Thank you. I received Fazup on May 23rd and I installed it immediately. It has been 6 days since I have it on my Samsung Galaxy S3 and for now, I don’t feel the anti-radiation effect. Maybe I am just not sensible to mobile radiation. I will wait some days to see if there are any effects. I received the box with the cloth microfiber. Now my ear is not “overheating” while I am talking on the phone. Moreover, when I wake up I don’t have the usual headaches or tinnitus (I sleep next to my phone). The only damper: the connection disappears from time to time. Hello, I’ve got an iPhone 4S and I received the cloth microfiber. I noticed that with Fazup I have a bit less headaches and my phone is heating less while I send messages or do other stuff. I will continue the test to see the long-term effects. On the other hand, I would like to know for how long I can you keep the patch before changing it. Thank you, Nabila. Nabila, Fazup confirmed us that the patch is wear-resistant when it is covered with a protective case (Fazup recommends to use all kinds of cases, except for the metal ones). If you don’t use a case, the patch is still very resistant, however the levels of friction from the daily use of our mobile phones are very high. Therefore, its lifespan might be shortened (from some months to 1 year, depending on the intensiveness of mobile usage). The effectiveness of the Fazup is guaranteed to last as long as the circuit on the patch is not damaged. Nevertheless, depending on the surface of your mobile phone, it may be possible to peel off the patch and reposition it quite easily (i.e. the Iphone 4/4S has a glazed surface from which the patch can be easily peeled off). In this case, your new mobile should just be compatible with Fazup and you should of course use a correct mold to install the patch. Fazup reduces mobile radiation and there is no doubt about that. I am really satisfied, especially when I use the phone in the car. It doesn’t interfere with other devices, what a pleasure! Thank you! I received the box, but for now, I haven't seen any difference. I will keep you informed if it changes. I have regular epilepsy crises, but since I got the patch, I haven't had a single one! This is a real revolution to me! I will wait the long-term effects, but the first week has already been very positive. I received the box and installed Fazup. I didn’t have a cloth microfiber, but it was not a big deal. For now, I haven't noticed any particular changes, but I hope to come back to you later to share my positive experience. Thank you for the test. The user guide is very simple, the patch is easy to install. My head is less astounded. I am very satisfied. I’ve got a 3 GS. I received the box, but without a cloth microfiber (I used a soft cloth instead). The user guide is very detailed, easy to use and well-illustrated. The scientific test promises spectacular results, but for now, I haven't seen any difference. Actually, the mold doesn’t allow to fix the patch in a precise position, so I did it my way. It is ESSENTIAL to use the positioning molds, provided by Fazup, or you won’t see any effects. Fazup has scientifically found specific patch emplacements for each of the compatible phone models. Therefore, you should absolutely respect the positioning provided by the correct mold. I received a complete box. The patch is quite easy to install, however it is true that the mold is not precise, because a small piece of the patch stood out from my phone and I had to put it up a bit. It is not very esthetical, but it is not its primary goal. Moreover, I have a black mobile case, so the patch is completely hidden. Concerning its effectiveness, nothing special for now. The patch reassures, but the scientific aspect is not enough explained to customers. Océane, it is very important to install the patch with the mold in the exact position, recommended by Fazup. For an iPhone 5, the patch stands out a bit and you can cut those millimeters off or hide it with the protective case. I have a Samsung, not an iPhone and the patch stands out on my mobile. Great, but this detail was not at all explained in the user guide, although it should have been. Océane, the patch never stands out from Samsung. It goes up to the edge of the phone, sometimes very low, but it never stands out. Don’t hesitate to contact the client support service on the Fazup website: info@fazup.com. They give a feedback very fast. Thank you for letting me test Fazup. It is not very esthetic and not very easy to install, but it is effective against headaches. I really recommend it. Hello. Thank you for this test, it is great! I don’t know if it is only my impression, but I have no more earache during long conversations… Apart from that, the concept is interesting, but the patch itself is not very esthetic… On the other hand, I would have appreciated if the molds had been cut in advance, it would have been easier. Very effective on my Samsung s3. Since I have Fazup, my migraines disappeared. We shall see long-terms. I think that this patch is really effective and discreet. I recommend it and I am going to buy Fazup for all my family members. Great!!! Really very effective! We can immediately feel the difference with the patch! I have also received the box without a cloth microfiber, but it doesn’t matter! I strongly recommend Fazup! Hello. It has almost been one week since I installed Fazup and my ear is heating less during the calls. My phone has also stopped heating that much, because before it was burning my hands while I was playing. I will buy Fazup for all the members of my family if those effects stay after a longer period of time. Hello. I am very happy to be chosen for this test. After one week of testing, I feel the first positive effects: my ear is heating less and I have less headaches… I recommend this product. Hello. After almost one week of testing, I started feeling the difference: fewer migraines and my phone is heating less. Thanks again for this test; it is really a pleasure to have such a product. I had some doubts before, but finally I recommend Fazup. Hello everybody. First of all, I am happy to be chosen for this test and very glad to have received the complete box (because some of you didn’t receive their boxes). The patch works and I can already feel it: my ear is heating much less, the tingling sensation is less intensive, I have less throbbing headache. Nevertheless, I think that the test should be done after a longer period to make sure that the effects are long lasting. It is quite difficult for me to believe that Fazup has eliminated my health problems based on my feelings. Anyways, my first impression is quite positive. Hello. First of all, I want to thank you for my box, I received it on Monday. Frankly speaking, I make many calls every day and I noticed that I don't have “crackle” sound in my ear any more, which is very pleasant and satisfying. The only damper is that the mold was not adapted to my Nokia and I positioned the patch “the closest possible”. It is a pity… I hope to get other samples to test soon because I love this concept. Thank you TesterTout! Jenny, it is essential to precisely position the patch, because the positioning recommendations where developed by Fazup during the series of scientific tests. I invite you to contact Fazup at info @ fazup .com. However, the mold that we sent you should correspond to the phone model that you had mentioned in the questionnaire, and it was not a Nokia. Hello. I am testing the patch from yesterday and I need to say, that from the morning the 3G doesn’t work. I have Free Mobile and an iPhone 5S. Did anyone have the same problem? I received the box without a cloth microfiber, as everybody. Very easy to install, but not very esthetic (which I can hide with the protective case). After some days of testing, I noticed that the phone is heating much less. Concerning my headaches, I shall see long-terms. Generally, very positive. Hello. I received Fazup and I’ve been testing it for 3 days on my iPhone 4. It is a wonderful discovery, bravo, because for now, my ear is heating a bit less (I don’t know if it is Fazup or just a psychological effect), we shall see with time. I didn’t have a cloth microfiber in my box. Positive points: user guide is well explained, the patch is easy to install and doesn’t bother you. Negative points: the box is quite difficult to open and the molds are not cut. Thank you for making me discover this product. See you. I received the box without a cloth microfiber. The patch is extremely visible and flashy on my iPhone 5C, which is not good. Fortunately, I have a protective case to cover it. As for its effectiveness, on the contrary to other testers, I still have my tinnitus. Maybe I sleep a bit better, but I haven't tested the product long enough to know if it is because of the patch. However, the phone is heating much less during long conversations! For now, quite a positive impression, we shall see after a longer period of time. Completely disappointed by this product. I’ve been testing it for 1 week now, but my headaches haven't got better. I lent my phone to my friend, who is very sensible to mobile radiation, but she hasn't hoticed any improvements neither. Big disappointment!!! Flypuce, could you please communicate us the phone model that you used for the test and the mold that you used for positioning? I also invite you to contact Fazup customer service at info(@)fazup.com. Thank you. Hello everybody. Very happy to test this product which is reassuring and which I would never have bought because I am very skeptical about its functioning. Just like Saint Thomas, I trust only what I see. I received the box without delay, but was disappointed because it was incomplete. There was no cloth microfiber in the pack and I am a demanding customer. Easy and even amusing to install and the moment of sticking the patch seems crucial. A small detail, the box is very difficult to open. I am satisfied, because the patch is invisible with my black protective case and you totally forget about its existence. Concerning the effectiveness, since 4 days of testing, I haven't noticed a big difference. I have an impression that my phone is less harmful, but I don’t have the exact words to describe it. The quality of network connection is changing quite often, but I don’t know if it is due to the patch. We shall see next with more testing data to report. I have an iPhone 4s. I received the box and easily installed the patch. The user guide is very detailed, which makes it ridiculously easy to install the patch. Concerning the effects, I haven't tested the patch long enough to see them all. Nevertheless, I have already noticed that the phone is heating less near my ear. On the other hand, I don’t think that the patch is very esthetic, but I’ve seen on Fazup website that in the nearest future it would be possible to buy special stickers to hide the patch. Thank you TesterTout for this discovery! I received the box. Positive points: fast and easy to install, I feel safe because I am pregnant, so it brings me comfort to be protected from the mobile radiation. Happy to be able to test this product. I have just received the box, now it is time to test the patch! I received Fazup and directly installed it on my phone. I decided to make a small experiment: I put my phone with the patch next to my acoustic system and made a call. There was no interference and that is wonderful! I don’t have headaches anymore, so the product is really effective. Moreover, when I make calls I don’t need to switch ears, they simply don’t heat. That is awesome and I really recommend this product to those who don’t have it! I received the package and installed the patch the same evening. Very easy to install. Not very esthetical on my phone, but apart from that, I have been sleeping much better all week long since I got it (and I sleep next to my phone, because it is my alarm clock). I also have less tinnitus. I shall see in a long-term ? I am quite happy about the product. I received the patch and attentively installed it… since then, no more tinnitus… super product. Thank you for making me discover this product. Here is the picture of the patch installed on my 4S. It’s been 4 days and honestly, I have no more tinnitus, which bothered me all my life. Therefore, I can tell you that it is a super product! The picture does not upload, too bad. Like many of us, I received the box without a cloth microfiber. I’ve been using the patch since Friday and for now, I haven't noticed any changes. However, I am happy to have it installed, because I feel more secure. We shall see with time. I rapidly received the box, however without a cloth microfiber. The mold to correctly position the patch on my iPhone 4s is very useful. It is a pity that I have to put away my protective case (or to buy a compatible one). For now, I haven't had any headaches since I installed the patch and my phone is heating less during long conversations. I will post another comment after some more weeks of testing. Thank you Cirhael. For your information, non-metallic cases are compatible both with your phone and with Fazup. I received the box, but haven't felt any effects for now. I will come back to you some days later. As (almost) everybody, I rapidly received the box without a cloth microfiber. The patch is easy to install on my iPhone 4 and visually it is very nice. For a little time that I've been using the patch, I haven't had any headaches. On the other hand, I noticed that the connection got worse at my place. Is it a coincidence or the consequences of the patch installation? As for effectiveness, we shall see long-terms. I received the box and was amazed by its presentation, which is not at all the same as on the box. I didn’t have a cloth microfiber neither. I am very sensitive to mobile radiation and as soon as I use my phone, I’ve got a tingling sensation in my hand. I didn’t feel an improvement and my tingling sensation didn’t go away neither. Concerning the difference in presentation, do you mean that the picture on the box does not refer to the patch itself? Normally, they are identical. Don’t hesitate to communicate us your mobile phone model and the mold which has to correspond to this model. I received the patch on Friday and immediately installed it. As many of us, I didn’t have a cloth microfiber. No big changes for me, especially because I use my phone mostly to surf the Internet. I still have migraines, but have some improvements during my calls. I’ve got an iPhone 4s. I rapidly received the box, without a cloth microfiber like many others. I shall see with time if it changes anything. Hello. I received the box this Saturday and a cloth microfiber is missing. I’ve got an iPhone 5s and the small part of the patch stands out from the phone, as it was told in the previous comment. For now, I haven't noticed any difference with or without the patch. Should I wait for a certain period to identify the changes? It might take 1 or 2 weeks to feel the improvements. Don’t hesitate to come back and share your opinion with us. Hello. I received my Fazup! I think that the design of the patch is very nice, the product is easy to install with the molds that were specially made for dfferent phone models. Concerning the test, I can’t say much, because I installed the patch not long ago. I will come back to you with another comment as soon as I finish my test. Hello. Honestly speaking, I haven't noticed any difference between “with” and “without” the patch. It is useless to me. You haven't noticed any difference concerning the feelings of discomfort, which you declared in the questionnaire, or at some other point? Hello. Thank you for this patch, which has now become essential to me. Busy weekend without headache was very good to me. The only negative point is that the connection quality, which was already low in certain places, has become lower. Hello. Received and installed, I'm starting testing it today. It was very easy to install with the help of the positioning molds. To be continued. Hello. I received Fazup without a cloth microfiber. First of all, I think that design is refined and it is easy to install. For now, I am satisfied with this product. I’ve got an iPhone 4 and my phone stopped heating in the ear area during my calls and what is more important, I have no more headaches! This product really and significantly reduces mobile radiation! At home, I have a Wi-Fi, which is constantly switched on and before Fazup, I had regular headaches and difficulties to fall asleep. I feel much better now. Thank you TesterTout for this test! Hello everybody. It’s been 4 days since my husband, who is a construction manager started testing the patch Fazup. He is spending his entire life on the phone and hates handsfree! Actually, he confirmed that his ear and cheek stopped heating that much. He has a Samsung Galaxy and he says to be more serene during his phone calls! Therefore, if the tingling sensation caused by the phone, which is heating his ear, disappears, Fazup has a new client! Thank you for this test! Hello. I received Fazup without a microfiber cloth and I installed it on my iPhone 4. For now, it is too early to say if it is effective for tinnitus and sleep difficulties. Unfortunately, it seems to effect the quality of connection. I will keep it for one more week to find out if those connection problems are due to the patch. I will come back to you in 1 week with another comment. Thank you for sending me the Fazup kit!! The installation is very easy and the patch is discreet. My phone interferes less with certain electronic devices, which is very pleasant. However, the patch seems to have an impact on the connection quality, which was already quite low! Since 3 days ago, my sleep seems to be more regenerative. I shall see with time ;) Meanwhile, thank you for sending it. I was glad to receive the kit in spite of the absence of a cloth microfiber. I stuck the patch to my iPhone 4. It was easy to install. Esthetically it has no defects, I even find it nice. Unfortunately, since the installation, I have problems with connection which I have never had before. As for its effectiveness regarding my migraines, I don’t think I can speak out immediately. I need to see the long-term effects, if I will not have to peel the patch off to get back my network connection. Pegasec, come back later to leave your comment about the feelings of discomfort, which you declared in the questionnaire. The best would be for you to come back to us 1 week later. Thank you. I received the box on Saturday morning! Tested and approved, my internal ear doesn’t make me suffer anymore, even when I talk to my mother :) Easy to install, not ugly, it is effective and protects! 100% approved! Thank you TesterTout.com! Hello, I received the kit for my iPhone 4 and the picture on the front cover shows me having migranes and regular headaches. What a good tester I am! And I have to say that I am amazed! Honestly! Almost no more, I stopped having headaches! We shall see with time, but the first three days of the test are extremely positive! Hello, I received a complete kit. The patch is easy to install and doesn’t pose any problems to a normal mobile phone usage. I installed it 5 days ago and I think it works at least for my migraines that seem to be less frequent. For now, I haven't noticed any particular improvements concerning the quality of my sleep, but I should say that my phone is on me all the time (a job constraint). Even though the positive aspects of the patch are difficult to quantify, it has no side effects, which is a virtue in the modern world. The precaution principle, which is essential in our life, tells us that it is better to have a patch, which has no effect, than not to have a patch, which might ease the discomfort caused by mobile radiation, which is all around us... Generally, the product convinced me! I recommend it for the test! I received the box on Friday and since then no more headaches or tinnitus! My husband is very interested, considering my results! Thank you testertout for this test and bravo Fazup! Anyways, I recommend it for an iPhone 4S. Here is a picture of my kit. Hello. I received the kit, but for now, I can’t say if it really works. Hello. The patch is very well designed and easy to install with the help of the molds. The packaging is well done. I even thought it to be less elaborated and luxurious. The only snag is the absence of a cloth microfiber, which was mentioned in the user guide (although it is not necessary). Concerning the usage, I think that the patch is effective, but I need more time to understand it and will give you my opinion later. Hello. I received and easily and rapidly installed the patch. However, I can’t talk about its effectiveness, because I would need special instruments to measure mobile radiation of my phone :) Thank you for this test. I installed it, but how would I know if there have been any improvements! It's a mistery, maybe it's better or the patch doesn’t change anything… Here you are! Do you feel any improvements of the feelings of discomfort that you declared? Anyways, letting us know what you think would be perfect! Hello. I installed Fazup on my iPhone 5C. There was no cloth microfiber in the box (but according to comments, they are out of stock). Now, saying that Fazup works is another thing… There is no way for a regular customer Lambda to control this system of protection from the mobile radiation… There is just a small drop in a network connection quality, but this is the only visible aspect… After all, if we make the assumption that what doesn’t hurt you does you good… why not. If I wanted to buy it I would wait for an independent customer study. FOS, Fazup is scientifically approved to be reducing the mobile radiation absorbed by the mobile phone users, which is why TesterTout accepted to suggest this test to you. You can consult the SAR tests conducted in accredited laboratory, which are available on www.fazup.com (PDF files, scientific validation section). Thank you for giving us your opinion concerning the feelings of discomfort, which you previously declared. The opinions of the TesterTout members are independent. Therefore, you can feel free to express yourself concerning any changes of your feelings of discomfort. Thank you very much for the kit. The installation is fast and easy, the patch is quite discreet. I am waiting for results. Thank you very much for this kit. I am often staying 2 or 3 hours on the phone with some of my friends and I often have headache or ringing in the ears after. With Fazup, I have no more headaches and ringing in the ears. I don’t even have any issues about leaving my phone switched on next to me when I sleep (before it was in an airplane mode). Therefore, I am delighted to be chosen for this test and I recommend Fazup in my circle. I received the kit, thank you very much. I immediately installed it on my iPhone. It has been 4 days now and I have an impression that this product is effective. I have less headaches when I intensively use my phone, but I still prefer to wait a bit longer before giving my opinion. The product is very easy to install and I am not a talented person. I received my kit! Only a cloth microfiber was missing. Otherwise, the kit is easy to use. However, I didn’t feel a real change concerning the mobile radiation. Maybe I am not a very sensible person! I know people, who are very sensible to the mobile radiation and I will not hesitate to talk to them about this product. Hello. I received my kit Fazup and it has been almost a week since I started testing the patch. I didn’t have a cloth microfiber in the box and according to comments many of you did not get it either. But it doesn’t matter, because the most important thing is that Fazup is very discreet, very easy to install and very thin (maybe with time and friction from the daily use of the phone it will rapidly peel itself off, but still, it has a lifetime guarantee). The phone is overheating less, but apart from that, I haven't noticed other remarkable effects. However, the test is not finished and I will come back to you to tell you the positive and negative aspects of the patch. Pierre, the patch has a lifetime guarantee only when it is protected by the case, which is indicated in the Fazup user guide. The protective cases (non-metallic) don’t cause any problems to its effectiveness. Hello everybody, I received my Fazup. I didn’t have a cloth microfiber in the box. The patch is easy to install on the phone. For now, I haven't seen any difference, but I’ve been using Fazup for only 3 days. I think that the patch is ingenious and discreet, especially with a protective case on it. I noticed that my battery discharges faster, on the other hand Fazup doesn’t impact the network. The patch seems to be effective. I have less headaches, but I will see after a while longer. The quality of the connection doesn’t seem to be lower. Easy to apply, but after only some days of usage, the patch started to get damaged on the edges. First of all, thank you for sending me Fazup. There was no cloth microfiber, so I had to clean the surface with another cloth. The installation of Fazup is very easy, when following user guide’s indications. After 3 days, I noticed a significant change in symptoms, caused by mobile radiation. There is almost no feeling of numbness for now and my migraines have significantly reduced. I received the kit. The installation is easy and I am waiting for my headaches to become less frequent! Still, it is a pity that we cannot use whatever case we like! I received the box. Easy to install and discreet. I think that I have less headaches after a long conversation. I am satisfied with this product. I received the kit and I am satisfied with it. Fast and easy to install, the patch is quite discreet, I am waiting for the results. for now, I appreciate it. Elise, which mold did you receive? Doesn’t it correspond to the phone that you indicated in the questionnaire? After some days, I have less tinnitus and my phone is heating less. To me, this test is very conclusive. Thank you for letting me test this product, which brings me comfort. I received the patch yesterday and I am delighted to have and test this product because I’ve seen some documentaries where they describe the risks connected to the exposure of the brain to the mobile radiation. I am very worried about this subject and the patch really reassures me. It is easy to position. I will talk about this patch in my circle so that my friends would also be able to protect themselves. Thank you for this innovation. I received the kit! Perfect, it was complete. I have an impression that the quality of connection is better with Fazup and that it crackles much less! Very satisfied! I received the kit! I was able to install it correctly on my iPhone! It is easy to install if you follow the guidelines. I noticed that my phone crackles less than before. Moreover, I have an impression that the phone is heating less. For now, only the positive points!! I received the kit, but unfortunately, I didn’t have a cloth microfiber to clean the surface. However, it is not important because I managed without it. Concerning the installation, it is easy, which is a good thing! After some days, I noticed that my phone is heating less during long conversations! Therefore, I have a positive opinion about this product and I recommend it to all the big mobile phone users! I received the kit some days ago. When I wanted to install the patch I realized that there was no cloth microfiber in the box. That was not a problem because I cleaned the phone without it, and it was the only bad point during the patch installation. It was quite easy to install the patch and I have to mention that the small stick was very useful for positioning. After a few days, I noticed that my phone was heating less, while charging and during my calls. This is a very positive aspect. I always have my phone on me at work and the connection is quite bad , so I used to have headaches almost every day. Since I have the patch, I don’t have any headaches anymore. I will see long-terms. I received my box yesterday and I don’t understand why I can't install the patch, even though my phone is a Samsung Galaxy S2. Noémie, your phone is compatible with the patch. Did you receive the kit with the mold to position an iPhone? Or Samsung, which should be the case? Yes, I received the molds for an iPhone and a Samsung, but only for s and s3. A Samsung S2 is not officially compatible with Fazup, but we can suggest you a solution. Please, contact Fazup customer service at info (@) fazup.com. Hello, I received my kit Fazup! At first, the installation is a bit tricky, but following the guidelines, we rapidly understand what to do. Very soon, I realized that my phone was heating much less during the calls. Concerning headaches, I will come back to you some days later to be able to express myself on this subject. Moreover, I sleep next to my phone, I have difficulties to fall asleep, and suddenly I realized that I could fall asleep more easily. I will see it after a longer while, but to me the experience is very positive! Thank you! Hello. I received the kit and I am very happy to be chosen for this test, because I never separate from my phone. I feel more serene when I am using my phone, I have less headaches and less ringing in the ears. I recommend this kit to everybody who wants to protect themselves from mobile radiation. Moreover, it was fast and easy to install following the guidelines. Thank you Testertout. Hello, thank you for choosing me! I got the box yesterday and immediately positioned Fazup on my Galaxy S3 mini. It was very easy to do with the help of the mold! I haven't used it enough to leave an exhaustive comment, so I will continue the test and will come back to you later. Hello and thank you for choosing me. I received the box on Tuesday morning and installed it straight away. The user guide is easy and well explained, the box was complete, and nothing was missing. Since I installed the patch, my Galaxy S3 is heating less, so my ear thanks you for that ? The patch is correctly installed. I have no headaches or toothache (weather or not it is true) after having long conversations. Concerning my nights, they are better now. No battery, connection or any other problems since the installation. Here is what I’ve got for now. I will come back to you in one week If I notice other changes. Generally speaking, the patch is good! I am once again delighted to be chosen for this test. Hello. Thank you for this test! I am a big user of a mobile phone and I am delighted to participate! I received my box yesterday, to be precise. Except for a cloth microfiber, everything was in the box. The user guide is clear and the installation ridiculously easy! One minute and hop! A small part of the patch stands out from my iPhone 5, but I have a protective case and it doesn’t bother me. It’s a pity that the website is not up-to-date concerning the compatible cases, because I didn’t find any information about it. I hope that my case doesn’t increase SAR… Anyways, I state having less tingling sensation… I didn’t test it enough to give a more exhaustive opinion. I will wait some days before coming back to you with another comment. I received the kit yesterday and it was complete. It was easy to install, because the user guide was very clear. I received the box yesterday and at the first sight, the packaging looks nice. The box is subtle and once it is opened, we can easily find all the needed components (except for a cloth microfiber, but it is not a big deal). The user guide is clear and it took me 5 minutes to install the patch on my iphone 4. The patch is barely visible. The only thing that is left is to appreciate the phone without mobile radiation thanks to Fazup. Hello! Thank you TesterTout, I received my Fazup kit. I will see after a longer period, but for now, I am very satisfied. The patch seems to work, I have less headaches. Thanks again. I received my Fazup and installed it on my iPhone 5 without any problems, thanks to the user guide. I regularly use my cellphone and I should rapidly notice all the health benefits, which are offered by this patch. Thank you TesterTout. After 2 days of testing, I don’t have any headaches, even though I spend more than 3 hours per day on the phone. I might have better nights, but I will see that further on. No more tinnitus, which is top! The only bad point is that the quality of my connection is lower now. Despite everything, I recommend this product as it is a small gesture for your health. Hello. Thank you TesterTout, I received the patch and immediately installed it on my iphone. I usually complain about morning headaches, but today I didn’t have them! I am very satisfied with this product and will leave another comment some days after, but for now, I am convinced! It is cool, I am calm and no more tingling sensation. Hello, I received the patch Fazup yesterday! The box is nice and carefully done. Inside I found everything that I needed to install the patch. Fazup is easy to install with the help of the molds. In 5 minutes it was done! The patch is esthetic and is not very visible. It is a pity that it says: fazup.com on the patch, it makes it less elegant. The patch seems to work, I have less headaches (it might be a placebo effect?) and my iPhone has a better connection. Thank you Fazup! Hello, I have just received Fazup. I installed it without a problem on my iPhone 4s. The user guide is clear and it is technically very easy to install the product, because each mold is made for only 1 phone model. I am a big phone user, due to my profession and it won’t take me much time to know if the patch effects our health. I have just received and installed the patch on my iPhone. It was easy and I still have 100% network and no problem during communication. Concerning the installation guide, I find it too detailed, but it deserves to be understood by everyone. I will keep the patch and see what happens. What I surely see is that my colleagues are very intrigued by the patch, which I have on the backside of my iPhone. I will explain them how it works with great pleasure. I received the box yesterday and I tried it straight away. I loved it! I had frequent headaches, troubled sleep and didn’t feel comfortable sleeping next to my phone (it is my alarm clock). Today I woke up in a good shape and I didn’t have a disturbed sleep. For now, Fazup brings only benefits to me! I received the product today and the installation was quite easy. For now, I am satisfied, but I will see later on. I received the patch yesterday and for now, I haven't noticed any negative aspects. I slept very good last night and today I don’t have any migraines, even though it happens quite often to me. I received the patch today and I am very happy, because it was easy to install and my phone interferes less with other electronic devices, which proves its effectiveness. The patch doesn’t affect my network. I will see after, but I still recommend this product to those who are sensible to mobile radiation. I received the box and I thank you for that. For now, I correctly installed it and even though it might be a psychological effect, I had a very good sleep this night. I will see later on. I received my box yesterday. The patch is small and discreet. Maybe I feel the difference only because I know that I installed it on my phone, but for the first 24 hours I had less headaches! I received the box yesterday and installed the patch. It was easy to install and the molds are very useful. However, a cloth microfiber was absent (I am not alone), although it was indicated on the box. The patch stands out a little bit, but I covered it with my case to hide it. For now, the connection hasn't changed and there was no problem with the battery. More comments later. I received the box. The patch is small and quite discreet. I have network problems since I installed the patch. It disconnects very often. Then, the battery discharges much faster. Nevertheless, I have fewer migraines in the morning. I received the box this morning. It was easy to install, because the user guide was well explained. For my iPhone 5 the patch should be placed quite low, so I hid it with the case, which is good. For now, no problem with battery or network. I will wait some days to see if there is any difference! Have a good day! I received the box this morning. It was not a problem to install it and apparently, it works. I think that the patch makes the battery discharge faster, but I will see with time. Usually, I turn the airplane mode on before going to bed to sleep better. Since I got the patch, I haven't done that, but still slept extremely good (which is essential for vacations). I will reevaluate it after the upcoming nights. I received the box yesterday evening. It was not a problem to install it, very easy. I will see in some days if I have any problems or effectiveness to report about! However, in the user guide it is written that I needed a special case. I have a plastic case and I don’t know if the patch is still effective with it. I don’t trust 100% the effectiveness of this patch, but it is better to try something in order to protect yourself from mobile radiation. Lauriane, the plastic case doesn’t affect patch’s effectiveness, but metallic case is not recommended (in general). Fazup is installed on my phone for 24 hours. I don’t feel anything yet, but the connection disappeared, bahhhh. Fazup prevents my phone from catching the signal, so I found myself without network half of the time. This makes my phone consume more energy, because it is constantly searching for the network. The effectiveness is not clear in my case because the phone is searching for network and emitting supplementary radiation meanwhile. I feel that Fazup will return into its box. The kit has arrived, we shall see what happens! I like the concept, but the positioning mold for an iPhone 5 is not adapted to the installation. The patch stands out from the phone a bit. I will start testing it today, but I will leave a comment in the end of the week. It is absolutely useless. The mold for iPhone is too big, moreover I’ve got a Samsung and there was no cloth microfiber! Ali, we sent you the molds that correspond to the phone model mentioned in your questionnaire. However, you shouldn’t use a mold which doesn’t correspond to your phone. Concerning the cloth microfiber, it is there just to clean the surface of your phone. I have just installed it. Now I can just wait to see if I feel any difference. I have just received Fazp. I will install it tomorrow, but as I leave France for 3 weeks, I will come back to you with the comment when I return. I used the mold that suits my phone perfectly, now I am waiting to see the difference. What should be the effects after a few days? Valentin, it is up to you to tell us. The reduction of the mobile radiation manifests in the following ways: the ear is heating less, less headaches… but it depends on you and on your feelings of discomfort. So it is up to you to see what you think about Fazup and to communicate us your opinion. The mold for iPhone 5C installed the patch too low. The patch stands out. There is no cloth microfiber. Now I will wait for a few days. This is a normal position; you can cut out a small part of the patch which stands out. A cloth microfiber is useful only for cleaning your phone before the installation, so there is no problem. The mold for an iPhone 5 corresponds to iphones 5, 5C and 5S, as it is said in the letter attached to the box. The patch is very low and even stands out from the phone for some millimeters (iphone 5s). I didn’t receive a cloth microfiber. The installation guide is very clear. For your information, the protective cases (non-metallic) don’t interfere with the quality of Fazup’s protection. Hope to hear from you later about the improvements related to your feelings of discomfort. Naoelle, it is essential to use the correct mold to install the patch. It permits to position the patch in the right place. Thank you for choosing me. I will leave you a comment as soon as I receive the box. Hello everybody. Thank you for leaving your comments about Fazup, after having tested their patch anti-radiation. Thank you for choosing me! As soon as I test it, I will leave my opinion! First of all, thank you for choosing me… Some days ago, I actually read an article about the mobile radiation… so I am absolutely delighted! I can’t wait to receive the box to leave my opinion… have a good day!